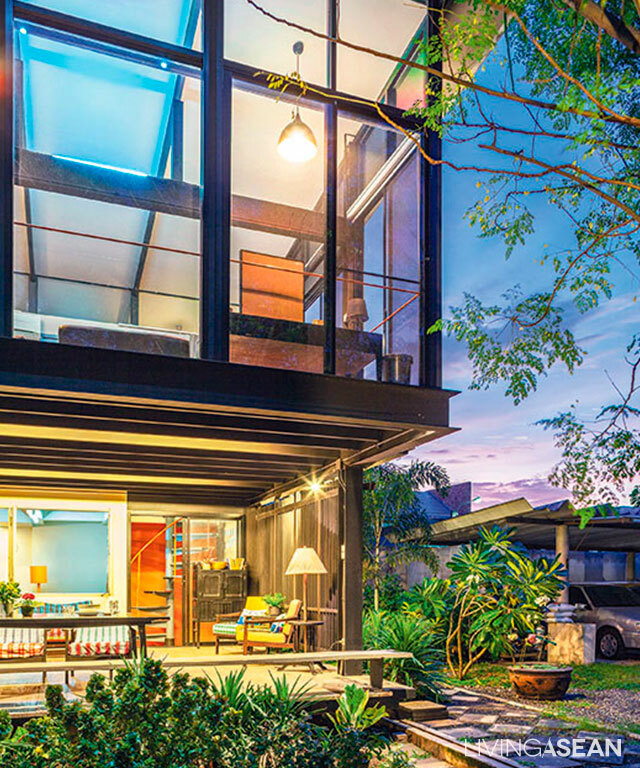 Everything about this modern home presents a perfect example of tropical residential architecture. Check this out. 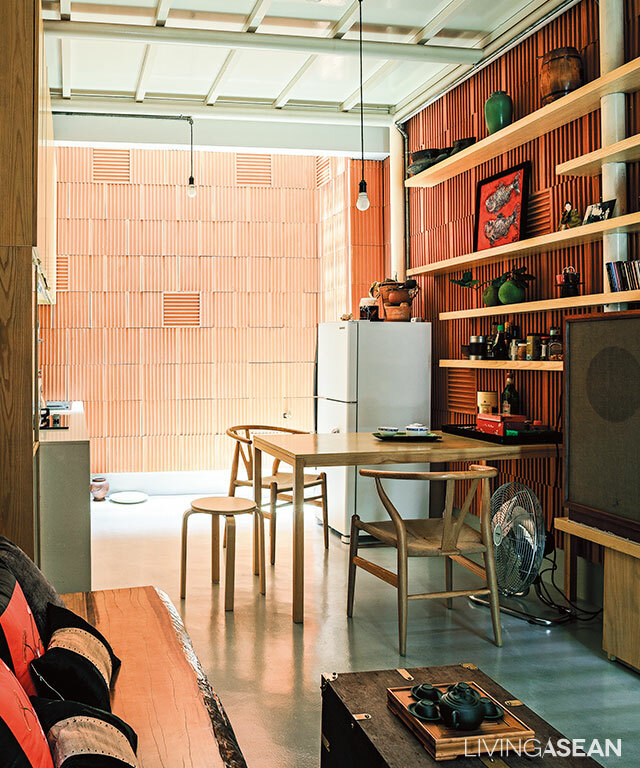 Andra Matin, the homeowner and designer of AM House, greeted us with a smile in his spacious multi-purposed room dominated by a solid-wooden long table. 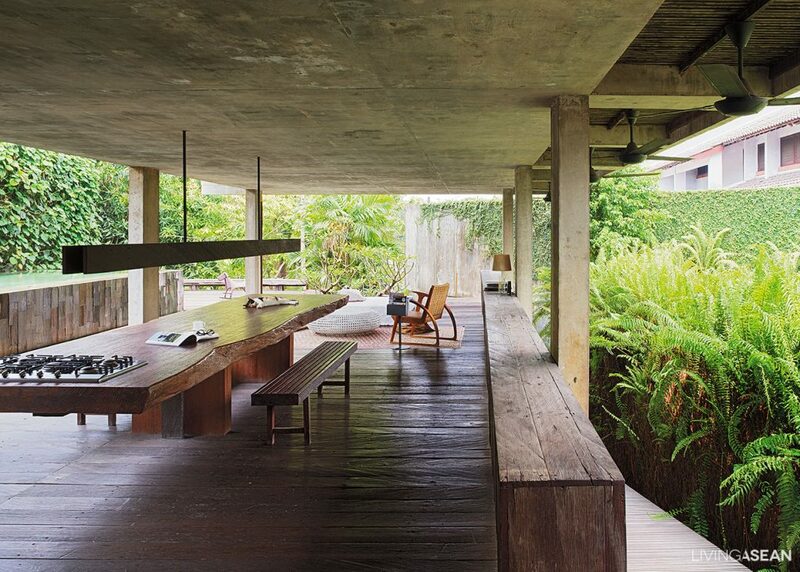 His tropical modern home was made of concrete, its unique stilt structures was outstanding. These elements intrigue us to hear what he had to say about the house. The pathway glides past a pond to the second floor. The entire ramp is paved with strips of timber set at half-inch intervals. 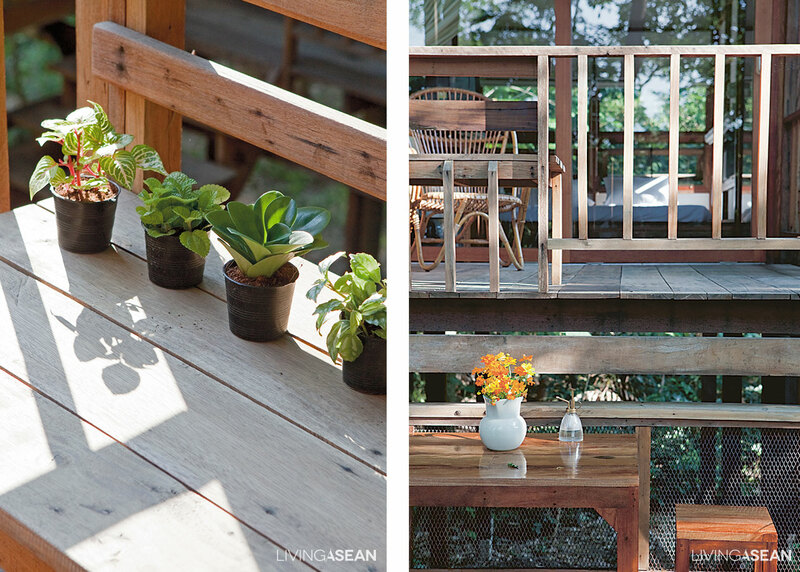 A wood deck extends from the multi-purpose space. Matin is widely known for his attention to details. 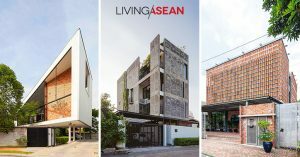 Ranking among the top-rated architects who is responsible for pioneering modern tropical design projects across Indonesia. 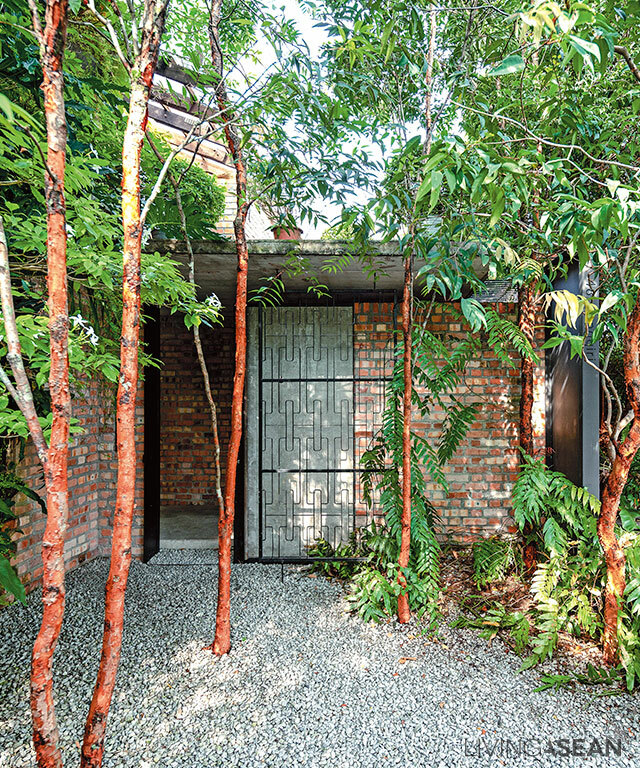 When it comes to designing a house to suit hot and humid climate, he relied mostly on nature and a clever floor plan. There are only two air-conditioning machines in the house. One is located in the basement bathroom, to control the humidity. And the other is on the top-floor bedroom. The multi-purpose room on the second floor is easily adaptable. 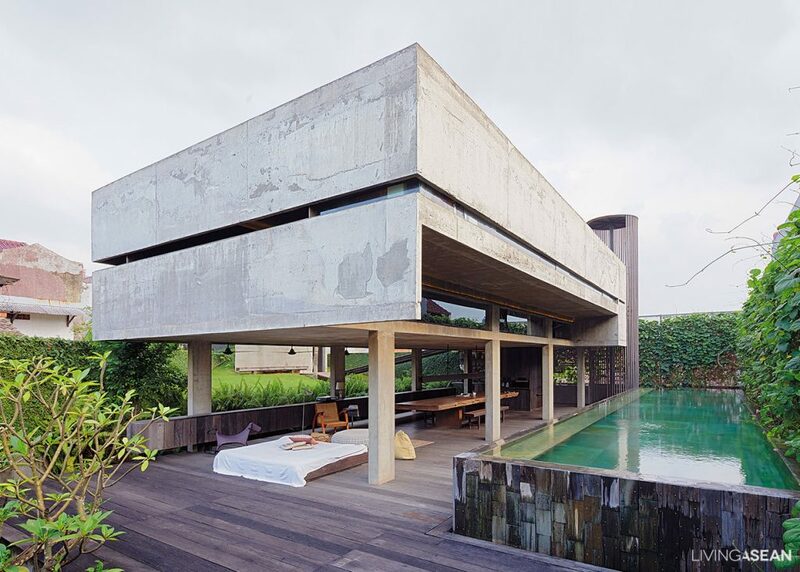 The design is in accordance with tropical climates. The cooking station is built into the tabletop. 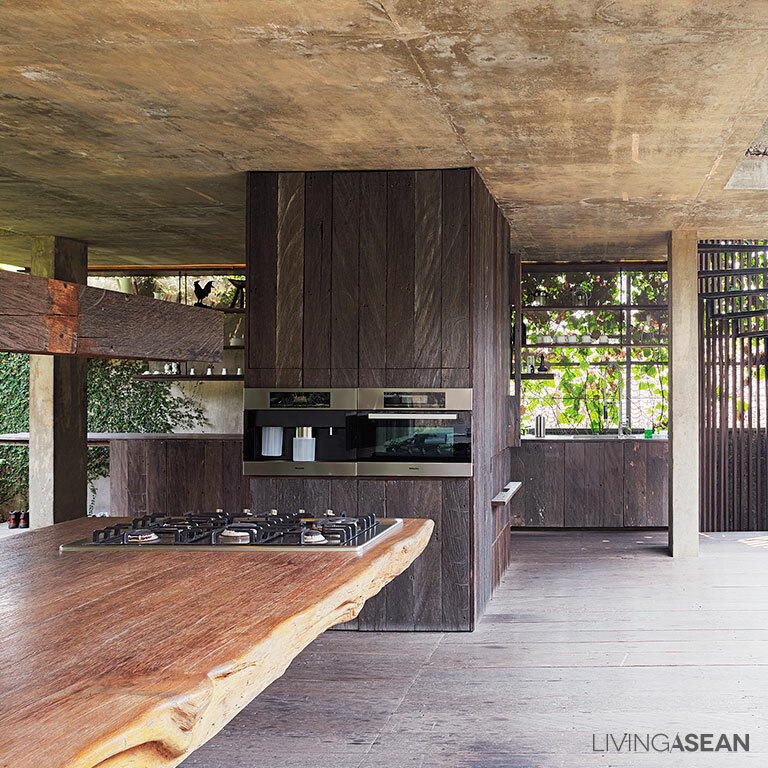 An oven and a nearby refrigerator are disguised by Ulin, Indonesia native timber. The staircase is protected by a screen of vertical strips that double as a handrail. 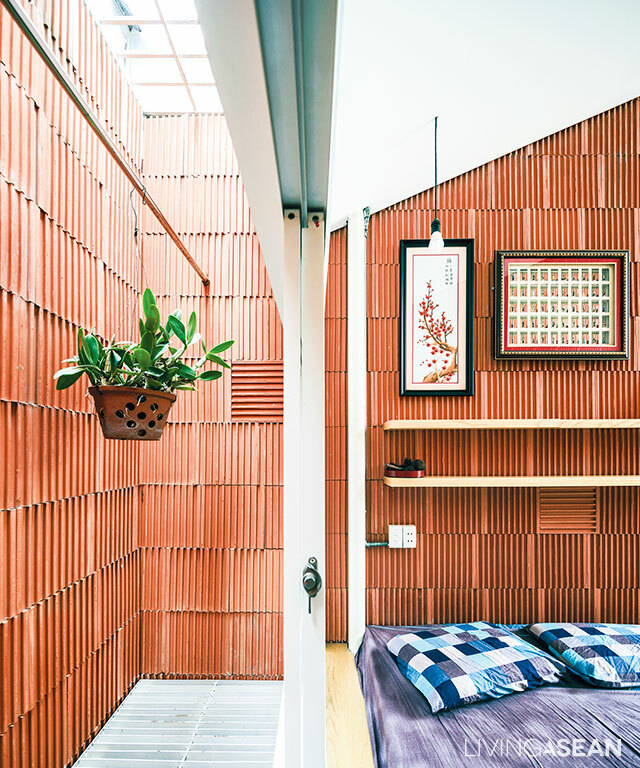 “I have always been interested in spatial relationships rather that the form per se.” Matin mention his interest which he adopted to his works and the designing of his home. The spiral staircase leads to a spacious bathroom with a walk-in closet. 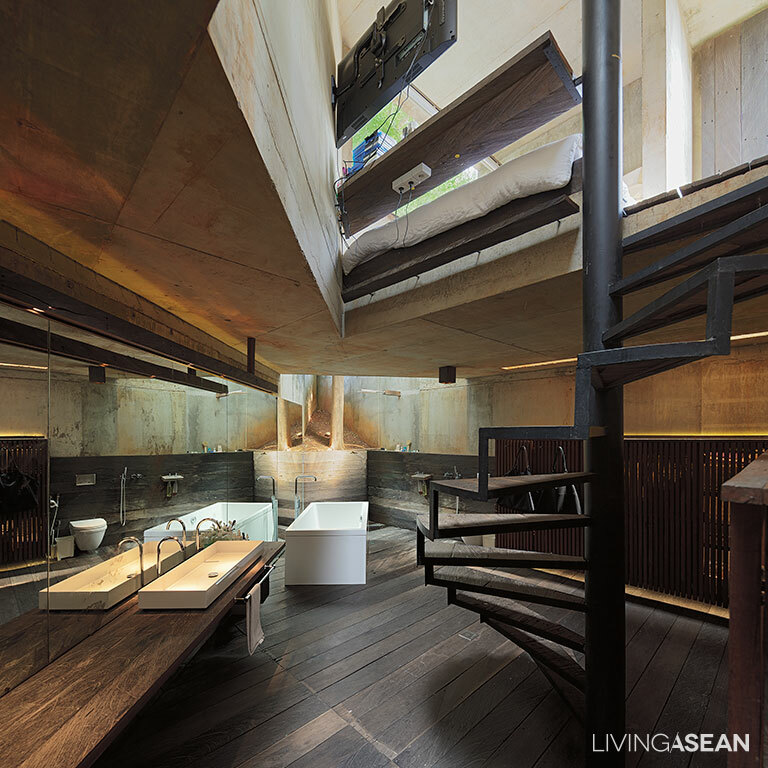 A shower area and a bathtub lie under a skylight. A small lodge in the backyard is Matin’s favorite hideout spot. The third-floor living space is adequately lit by natural light via the skylight right. On one side, floor-to-ceiling windows allow soft, diffused light in. During the day, there’s no need for an artificial light. 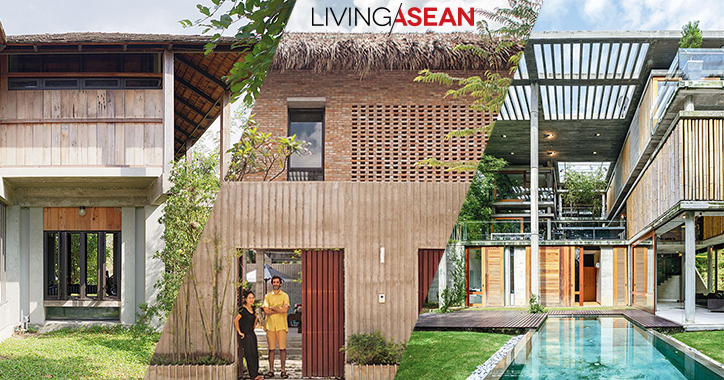 Apart from architecture, Matin also has a strong passion for travel. Hence, this house is full of fun gimmicks to make walking from room to room like an exciting adventure. The entrance is through the hill. 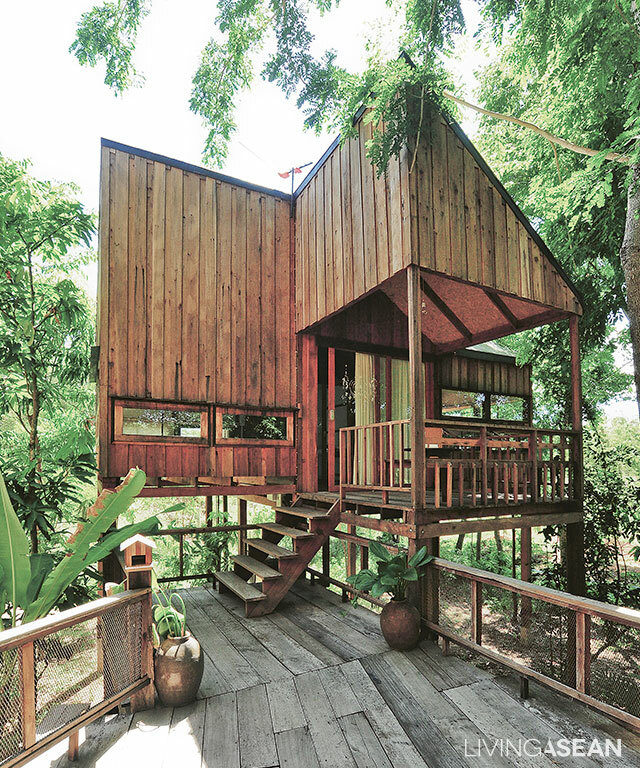 Followed by a lounge area with a spiral staircase as a shortcut to a rooftop on one side and a tilted floor leading to a small lodge. 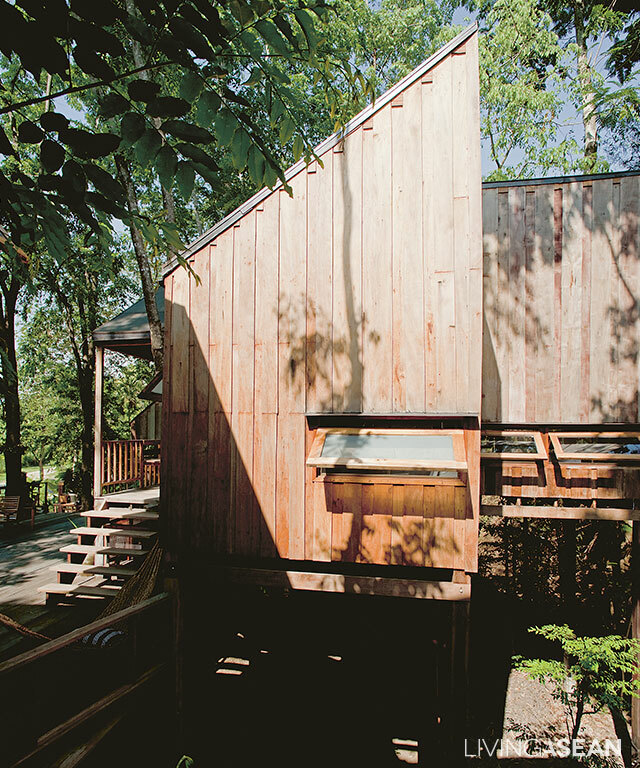 A children room is also accessible through the lodge. A working space on the ground floor also has a backdoor hidden behind a bookshelf. 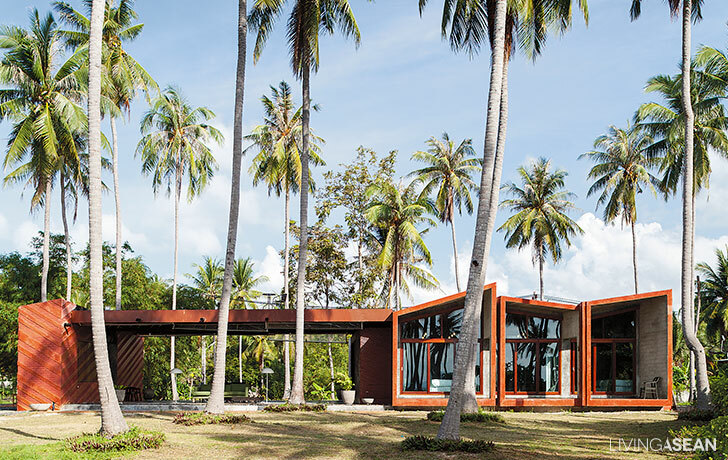 The endless wonder in this modern tropical home is indeed no less than Peter Pan’s Neverland. 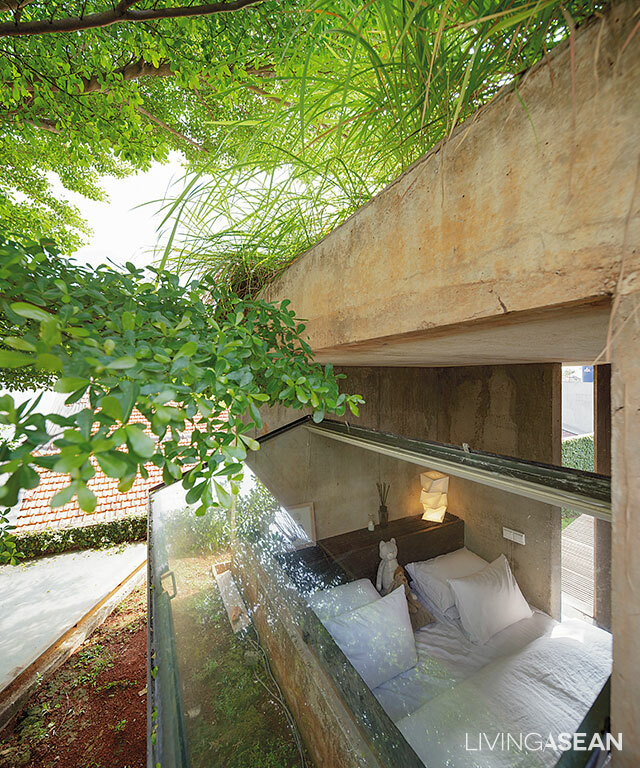 The sloping lawn that covers the rooftop gradually descends and ends up on top of the bedroom window. 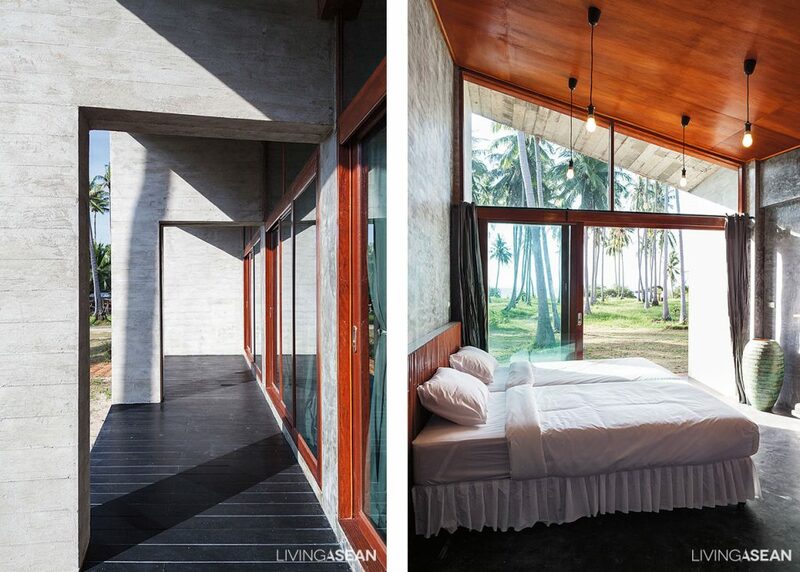 The horizontal opening in the wall allows just enough natural light inside. 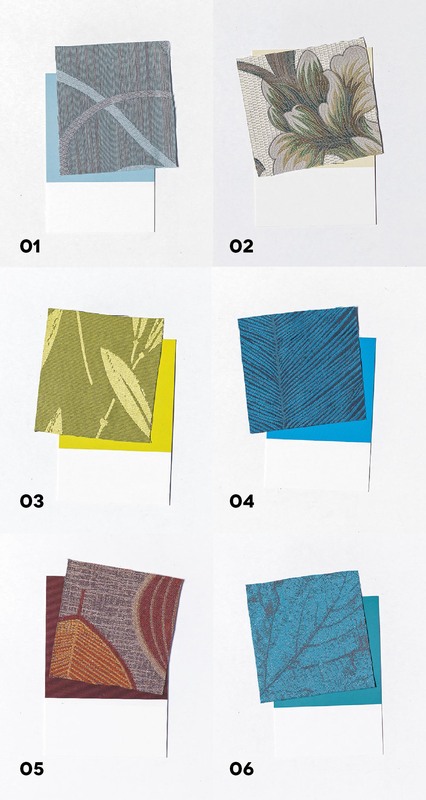 The design is to avoid strong tropical sunlight. 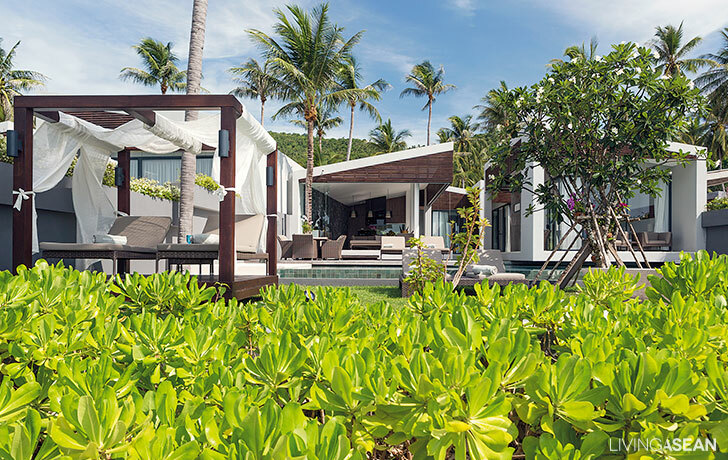 Ensconced in a coconut grove by the sea, Baan Somjai is both a vacation destination and private residence located on beautiful Pha-ngan Island. Time goes by slowly on this part of the island, so slow that it feels like time is standing still. A water pond running the entire stretch of the building contributes to thermal comfort as the weather heats up. 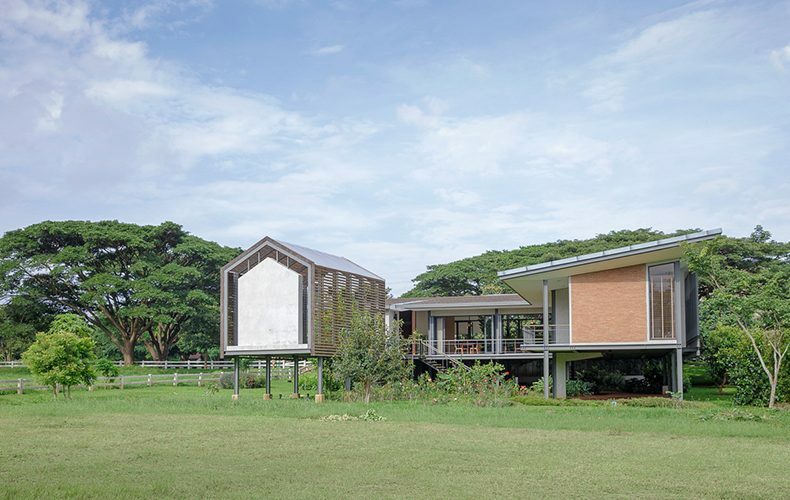 The holiday destination is the brainchild of Nattawut Piriyaprakob of NPDA, who is the designer and son of property owners Banjob and Somjai Piriyaprakob. The land is a heritage from Nattawut’s grandmother. Nattawut traveled back and forth to the property often. Back in the days it was nothing but coconut trees. 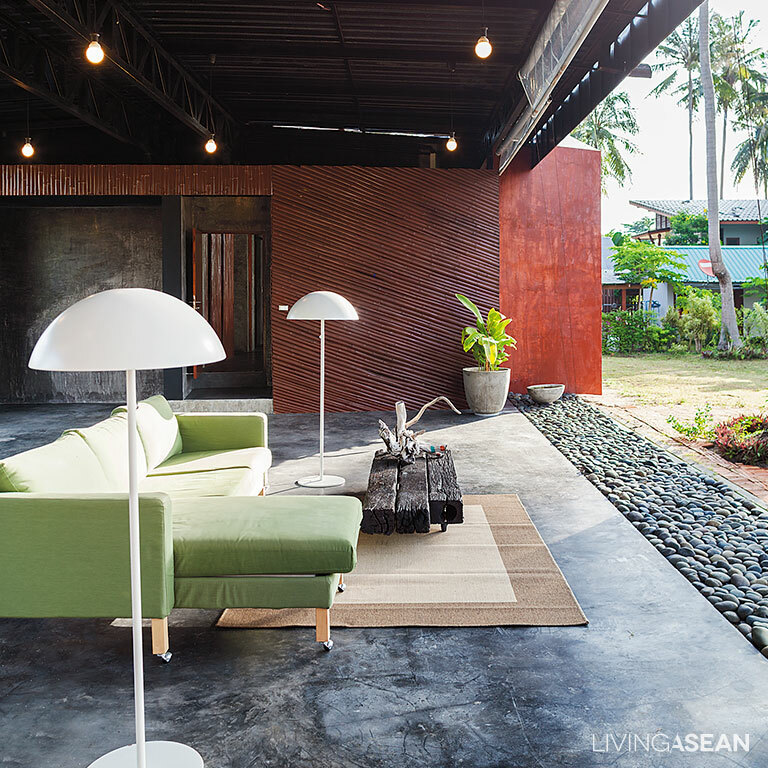 The wide-open seating space comes complete with floating furniture for ease of care and flexible uses of space. 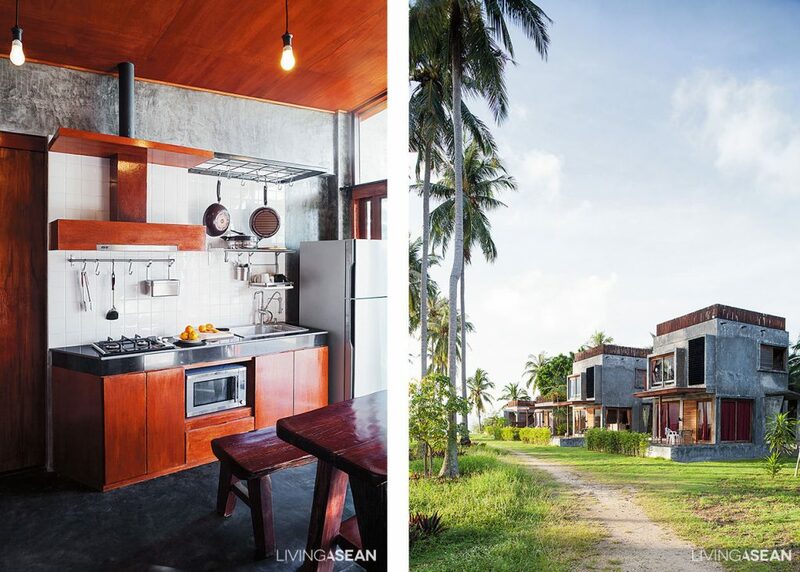 The homestay had welcomed all kinds of tourists from backpackers in the Full Moon Party to European families, which inspired Banjob and Somjai to build a permanent home here. They enjoyed getting to know new people every day. The bedroom, dining room and kitchen line up alongside the front porch. 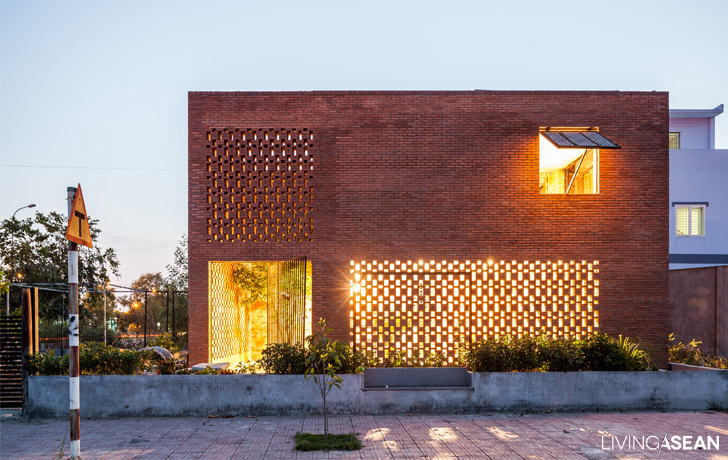 The exterior walls and the roofs are fixed at a tilted angle that best protects the home from the glare of the sun. 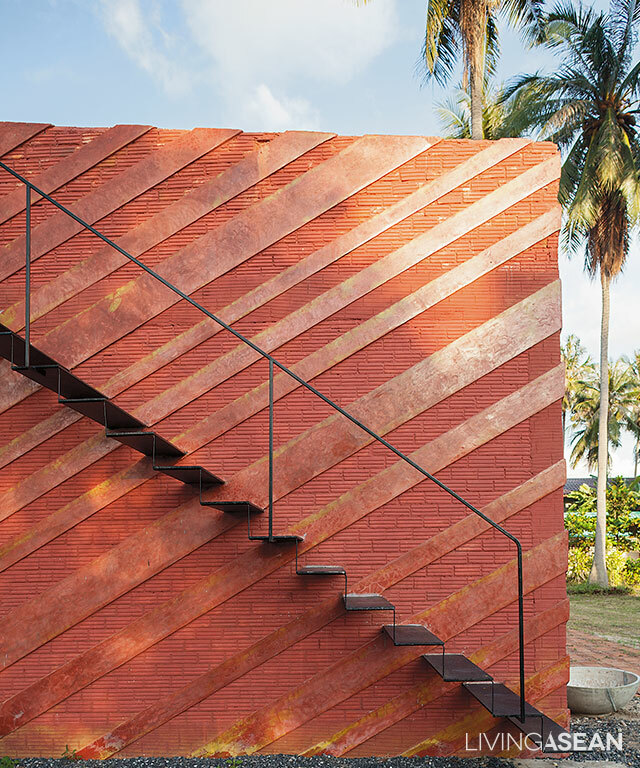 The brick wall boasts diagonal plaster stripes in glossy red contrasting with the brick foundation in matte finishes. 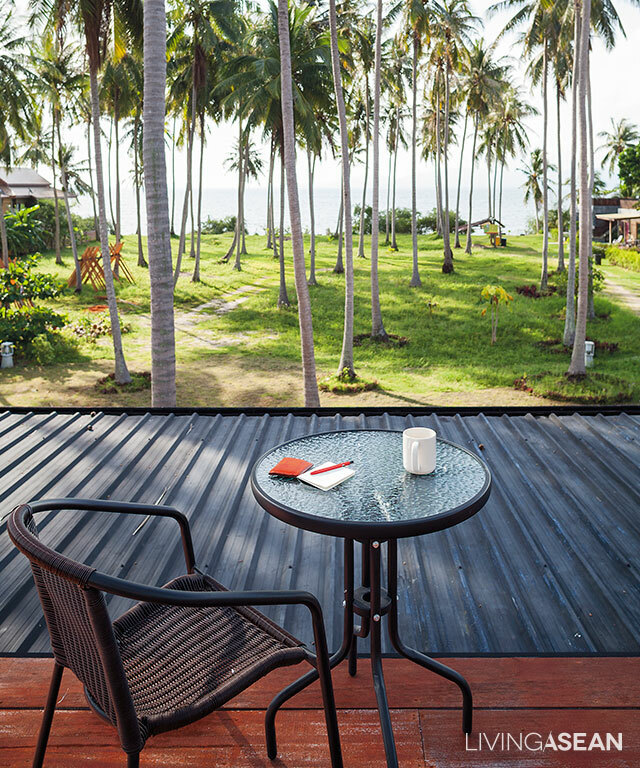 The sundeck that is Banjob’s vantage point offers 360 degrees views of the coconut grove and the sea to the further side. Benefiting from the sea breeze, every room is well ventilated. Opaque walls on the west shield the building from the afternoon sun, while the pond helps disperse the heat. 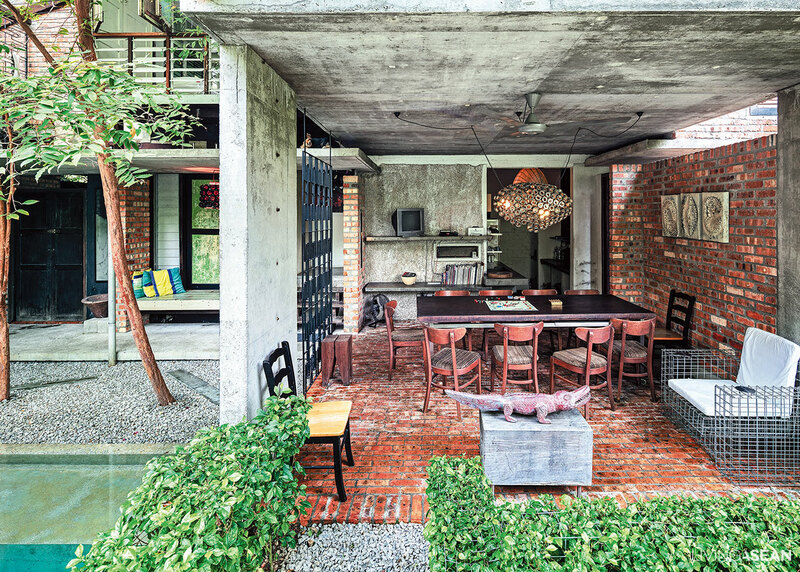 Altogether, the design cools the house down even when the weather is hot. 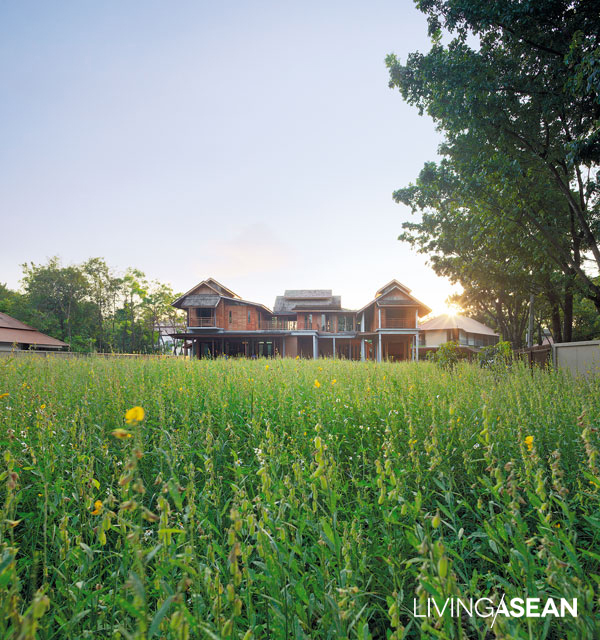 With generous hospitality and good design, Baan Somjai seaside Resort is not only a home to the Piriyaprakob family, but also a dream destination for travelers from across the globe. A lot of work and research were invested to this home renovation project. 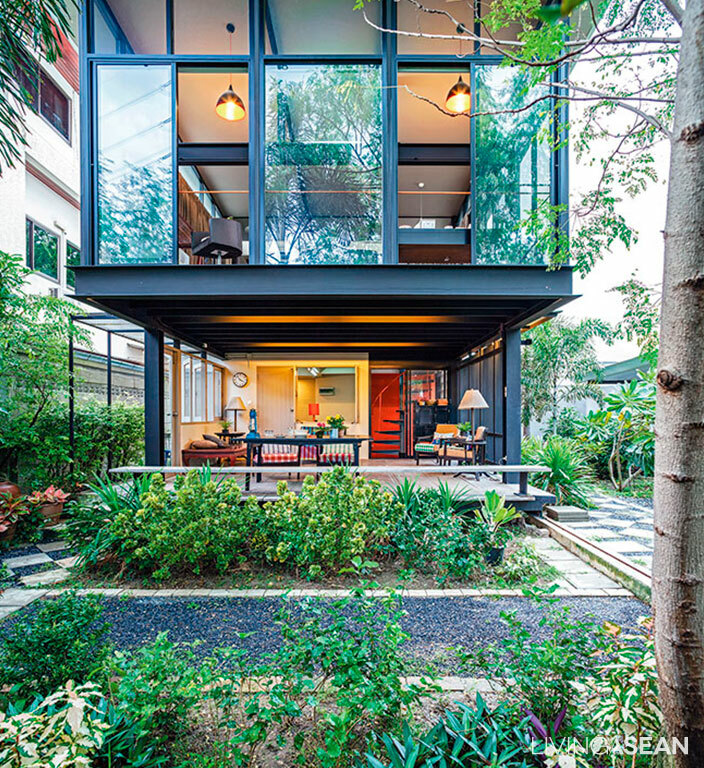 The big question is; how to make the compact house looks wider. 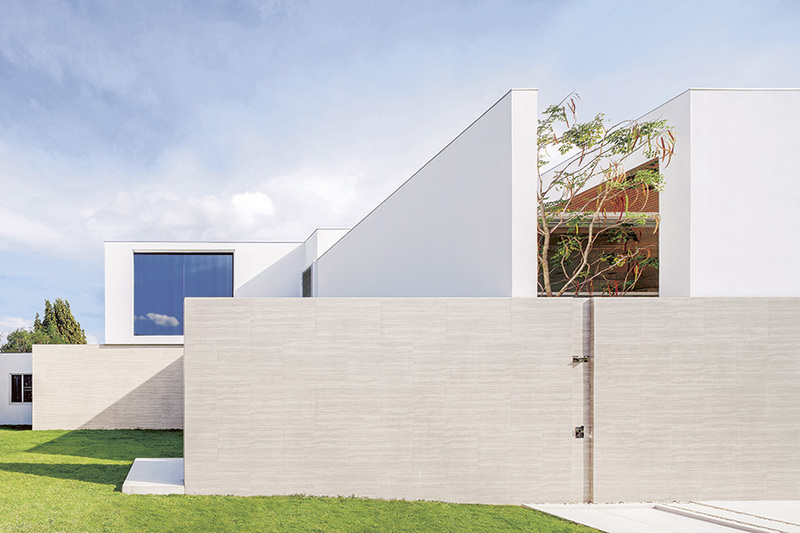 Home renovation: The project is accomplished without any concrete construction. The new second floor rests on cylindrical steel posts instead of big cement pillars. 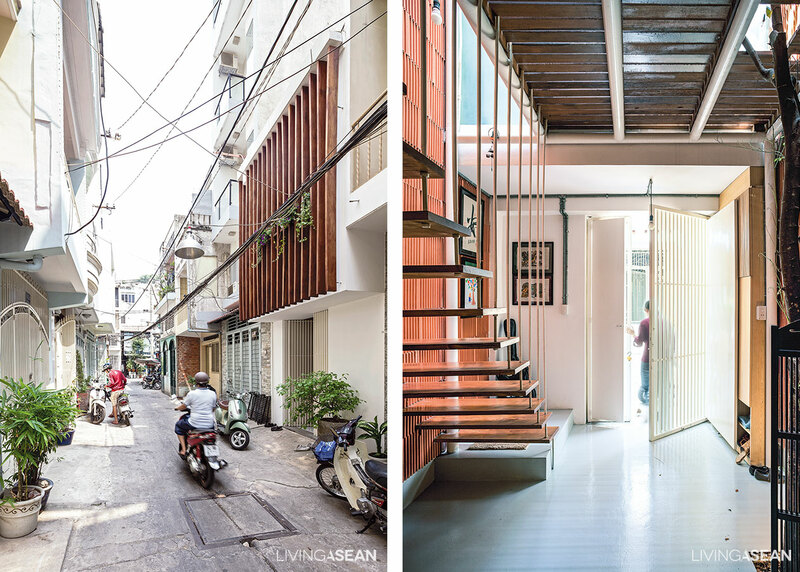 Like most residential buildings in Vietnam, “3 x 9 House” was renovated from an old shophouse. It has only few windows and solid brick walls was making the building look dimmed. 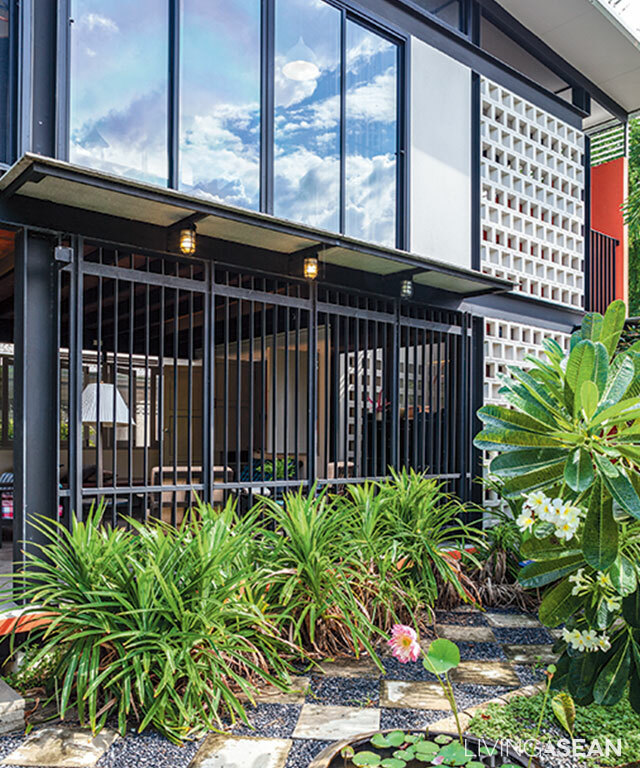 A bold move was needed to change both the building and lifted up the mood for the residents. 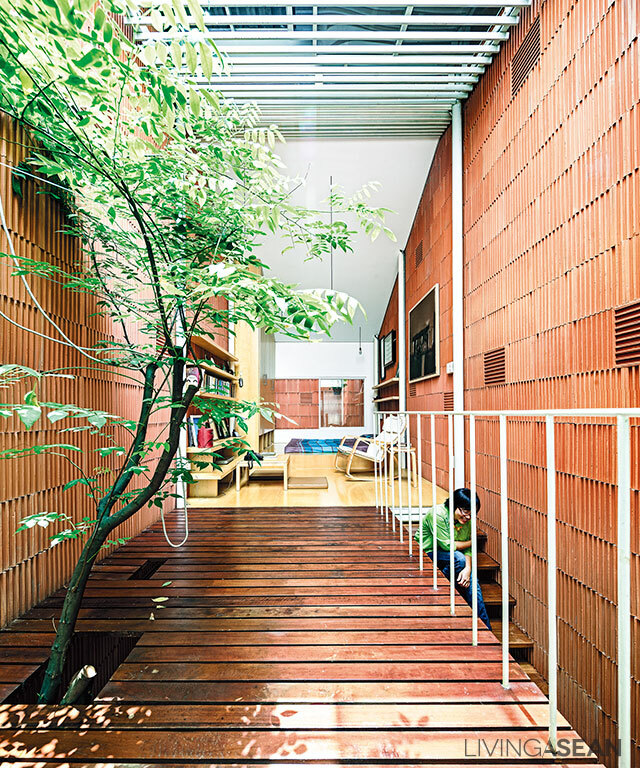 The 3×9 meters house has become a point of interest by integrating natural features. 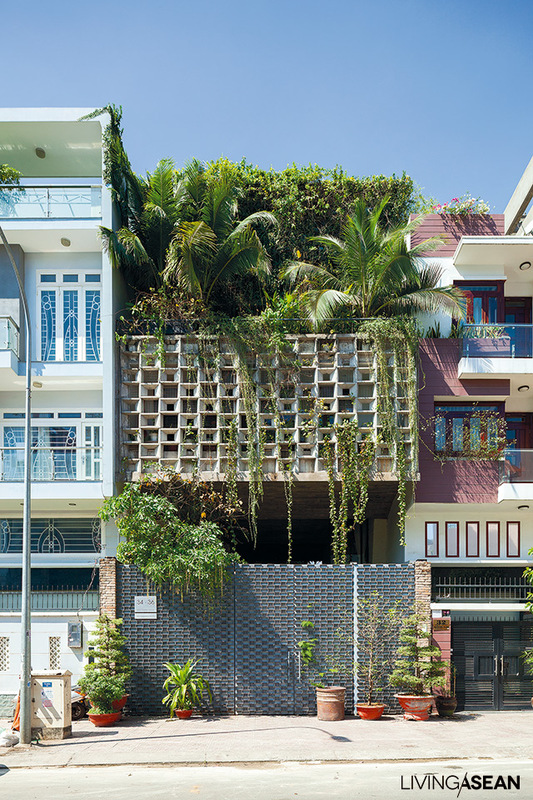 As land prices in Vietnam continue to rise up every year, finding a new home may seem like a formidable task. 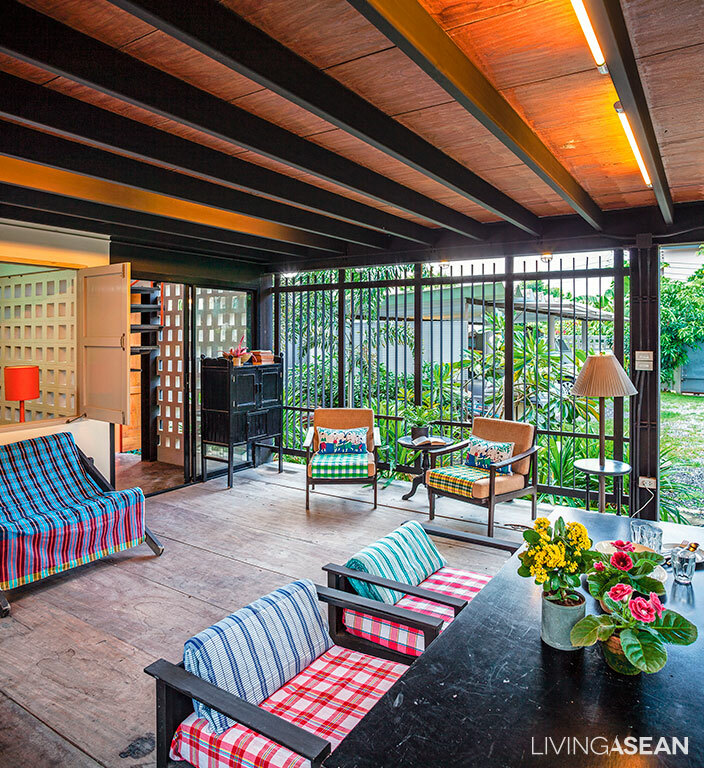 So the owner thinks it wise to invest in renovating his existing home. 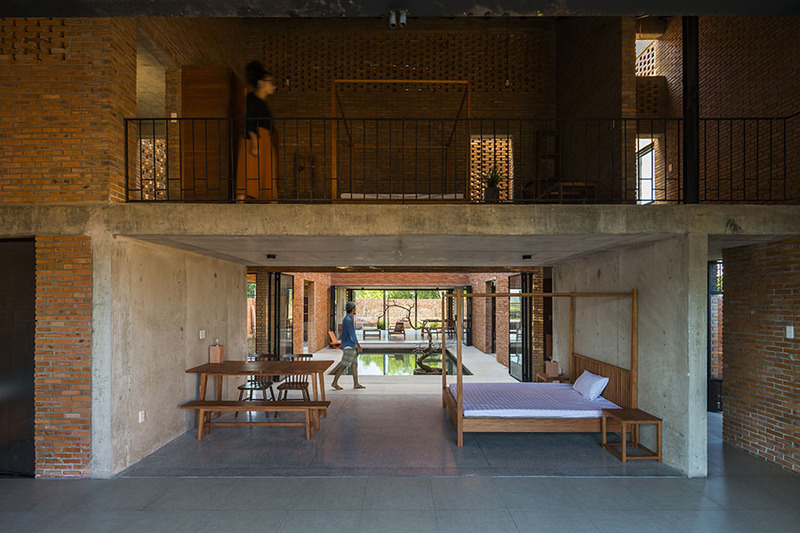 He reaches out to A21 Studio, for their reputations include turning small homes into nice, uncluttered, and environment-friendly living spaces. 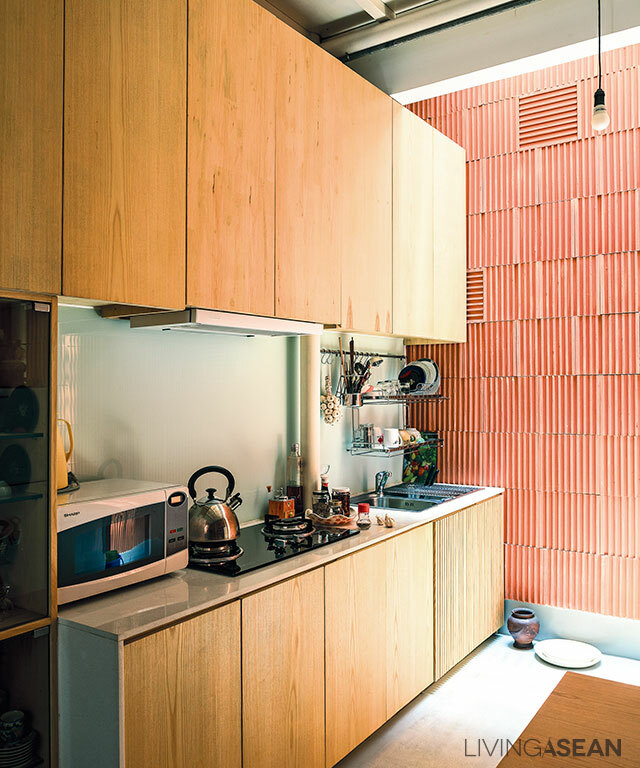 Clay tiles are placed inversely on the entire interior walls to create stripe pattern and unique touch. 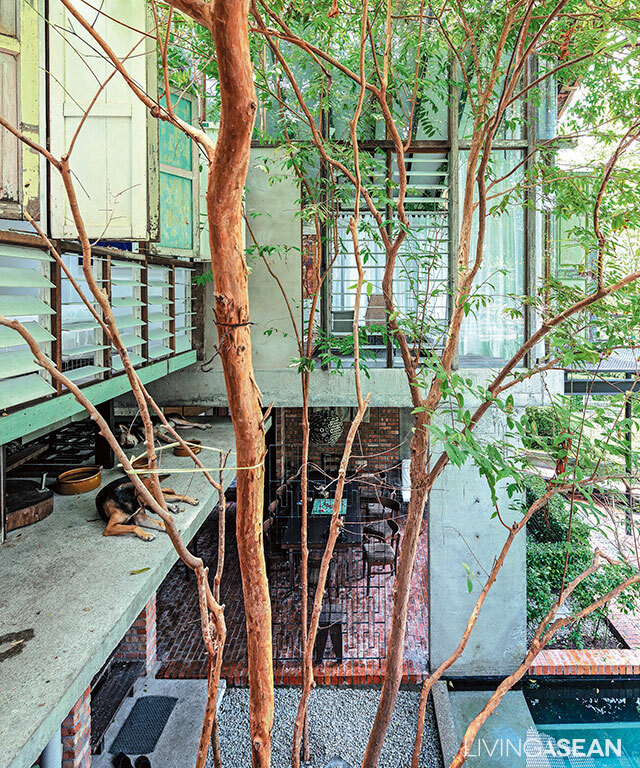 A tree grows up through an opening greets visitor from the entryway. 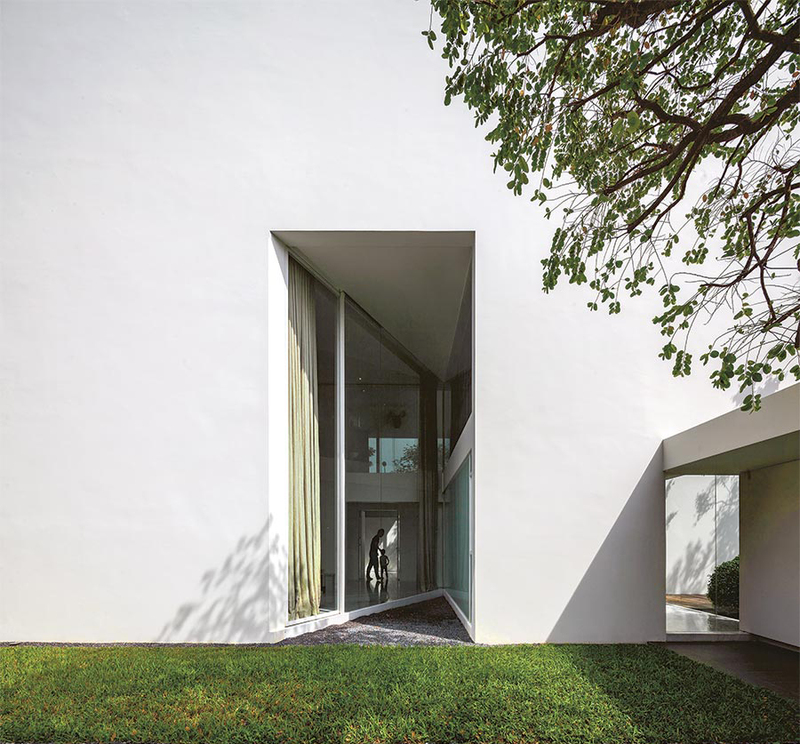 The skylight roof illuminates the interior spaces and enables light to reach to the tree. The steel structures roof is equipped with a sliding skylight. 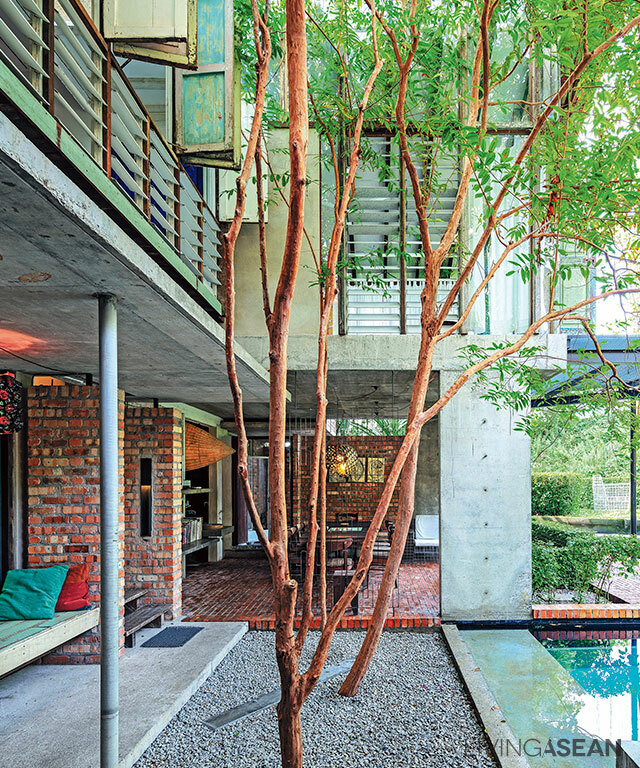 This effectively illuminates interior spaces and allows the tree to keep on thriving. 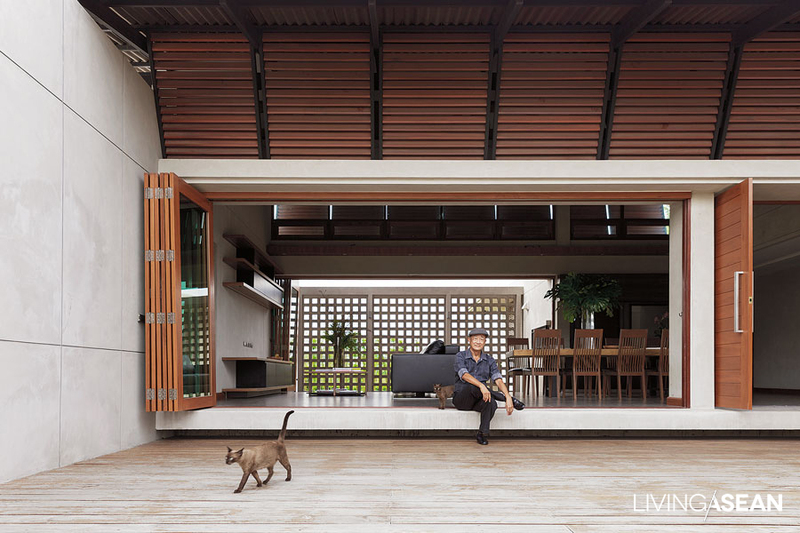 Breezy wind is able to flow through the front door and flow throughout the house, including the rear section, the second floor and the translucent sliding panel on the rooftop. 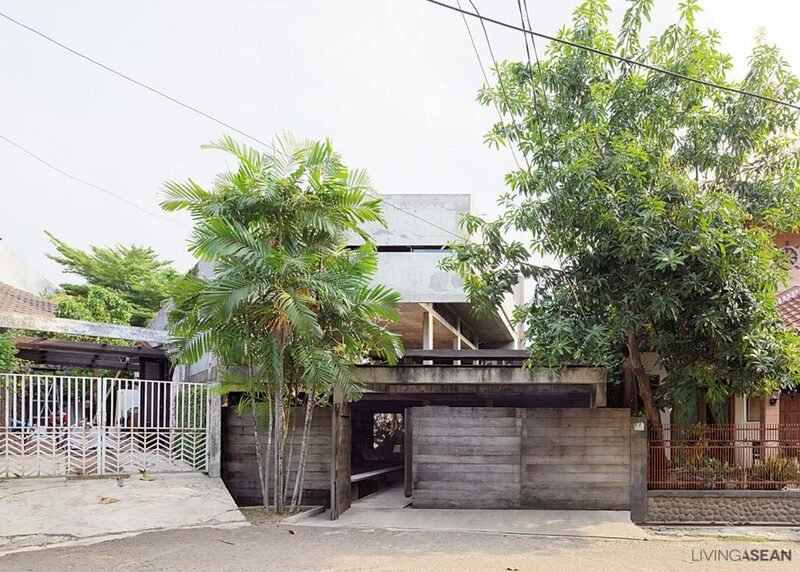 Flanked by three-story houses on both sides, the house is exposed to sunlight only during mid-day. So, no air-conditioning machine is needed. 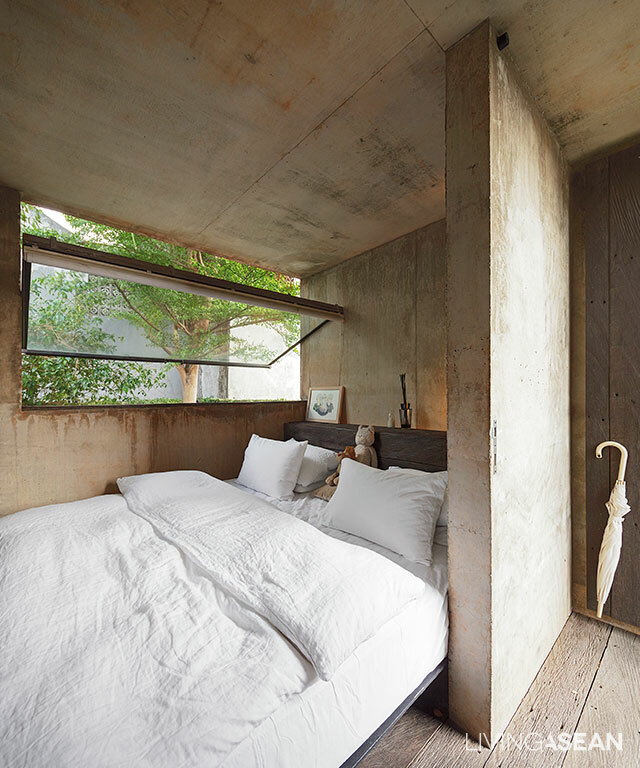 A skylight illuminates the bedroom space. Giving it a neat, organic appearance. 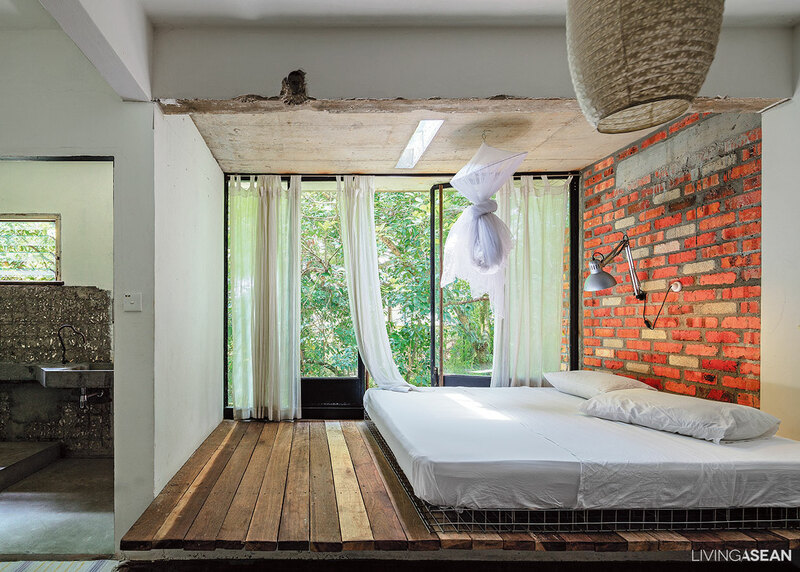 The bedroom has a low-rise platform and a mattress. 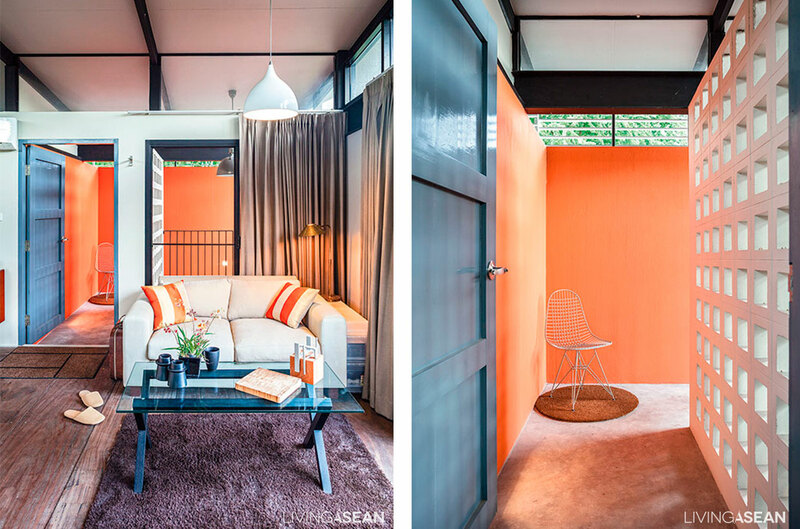 The absence of room dividers gives the area an open, airy, and uncluttered appearance. 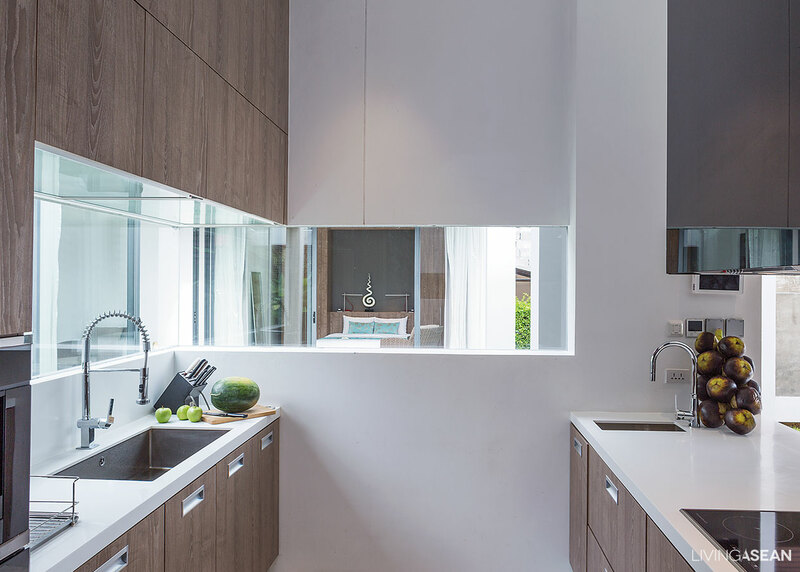 An open kitchen is designed to eliminate smoke and unpleasant smell via the window on the top. 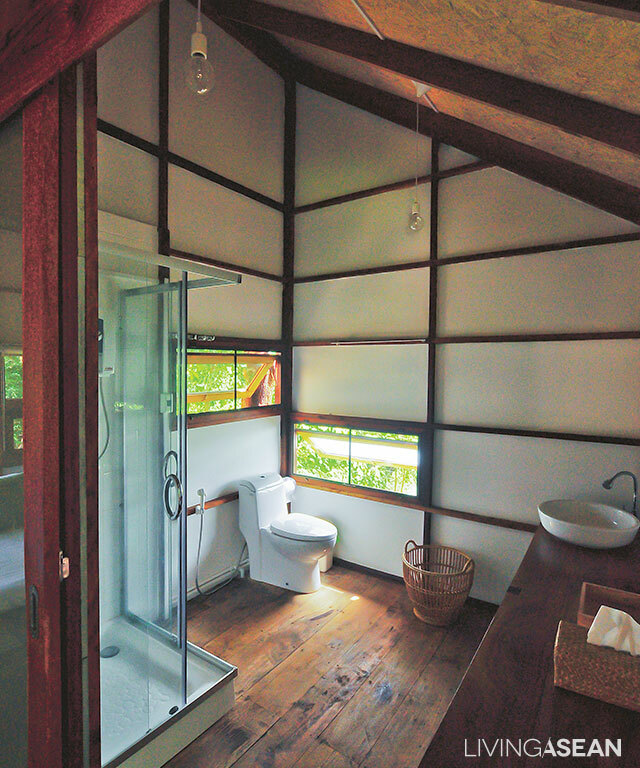 The interior avoids the use of a divider, the only exception is a bathroom. 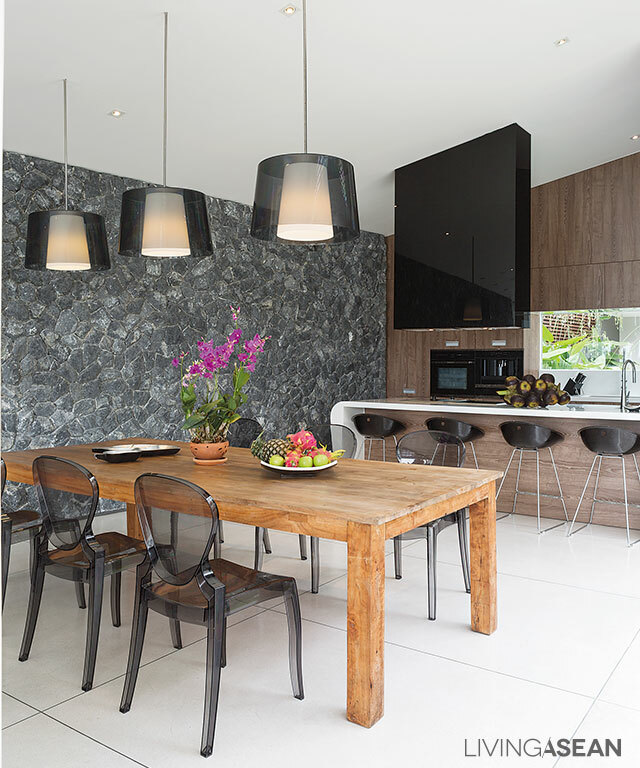 The ground floor comprises of a sitting area, a dining area and a kitchen; all connected. 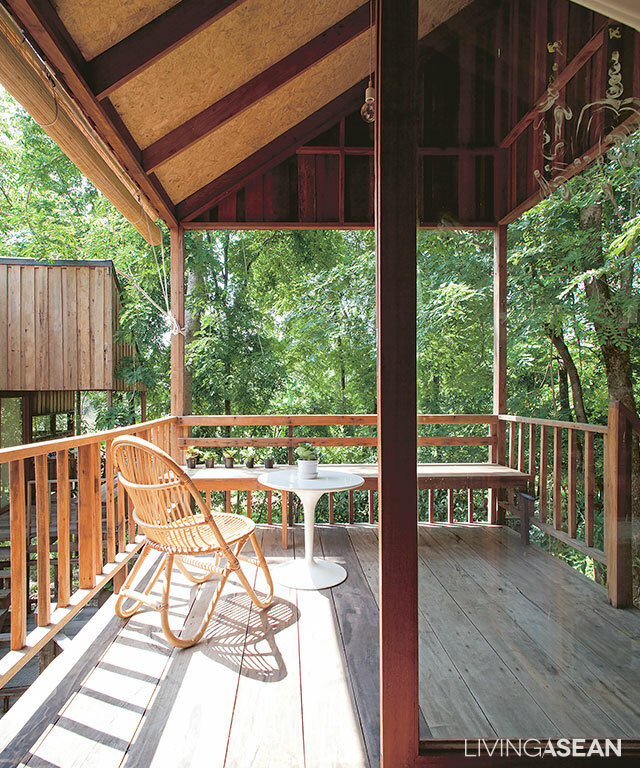 A bedroom and a leisure area are rested upstairs. 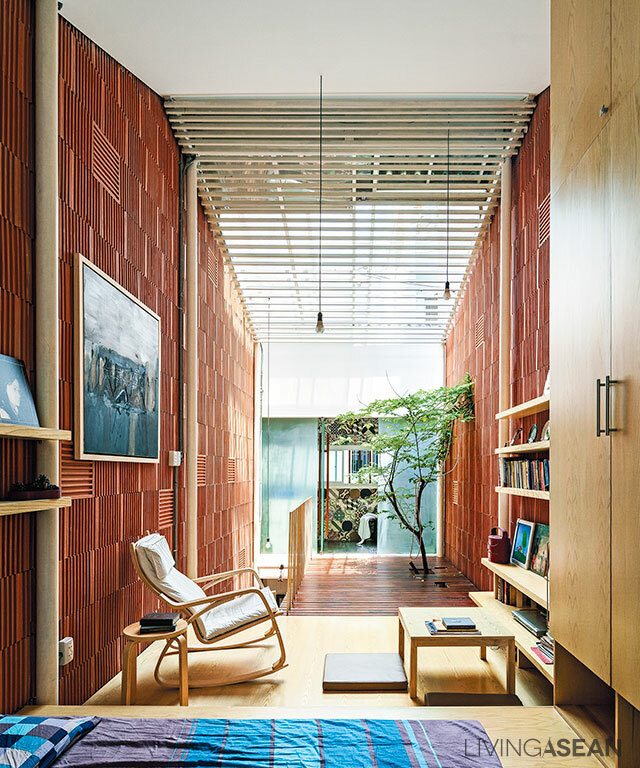 Since the owner lives alone, room dividers are of no use. 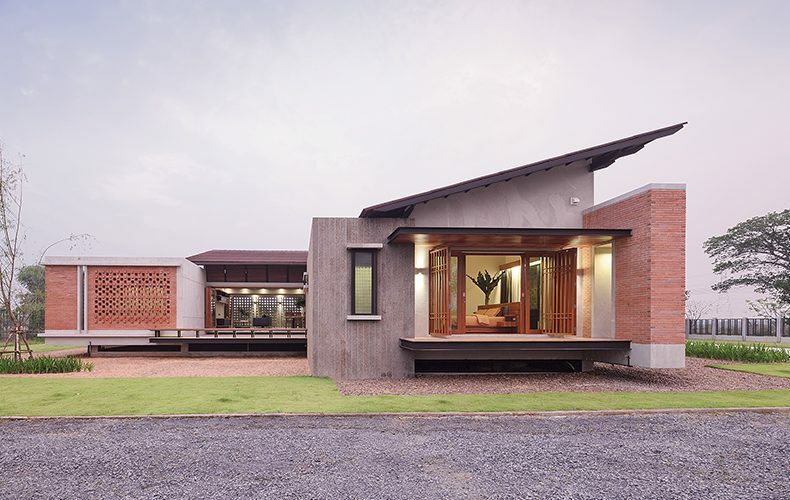 Thus, the main idea of this home renovation is to focus on openings and improving its ventilation system instead. 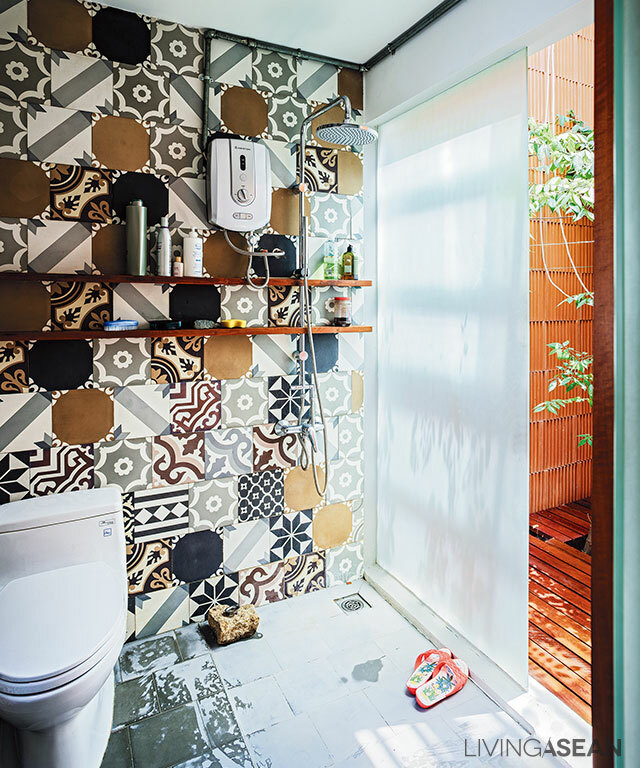 A colorful mix of tiles are reminiscent of vernacular architecture. 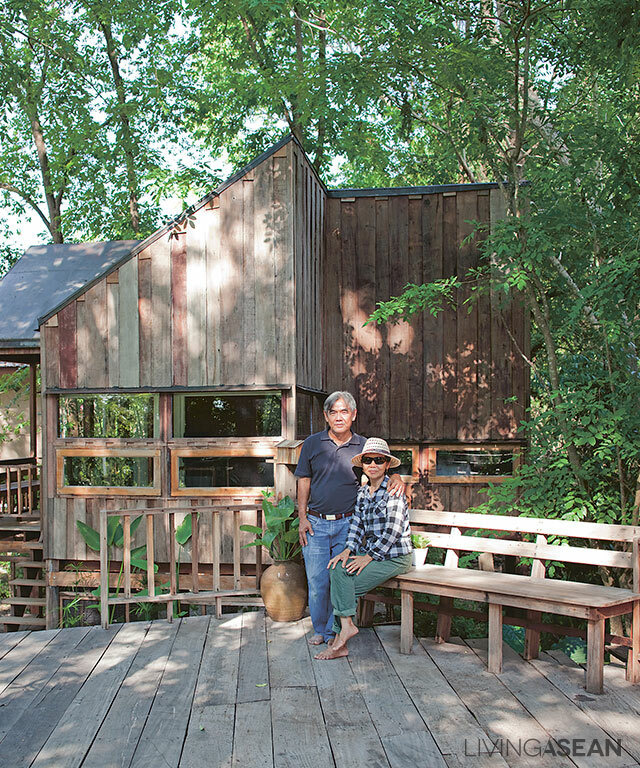 “Saving every tree on the property” is the motto from the owner. 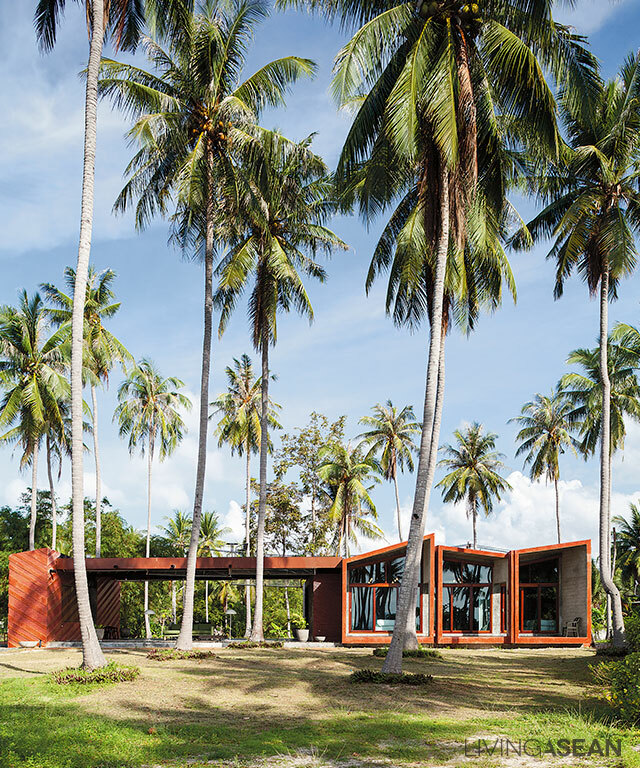 Studio Miti designed tropical houses that blend in with the forest. 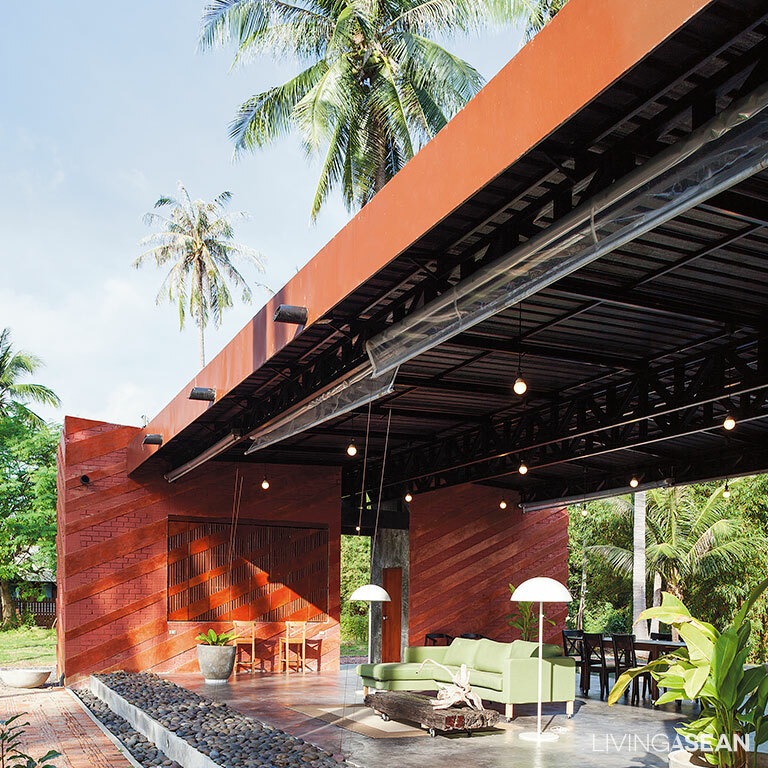 As the architecture is the fusion of modern and traditional Thai tropical living style. 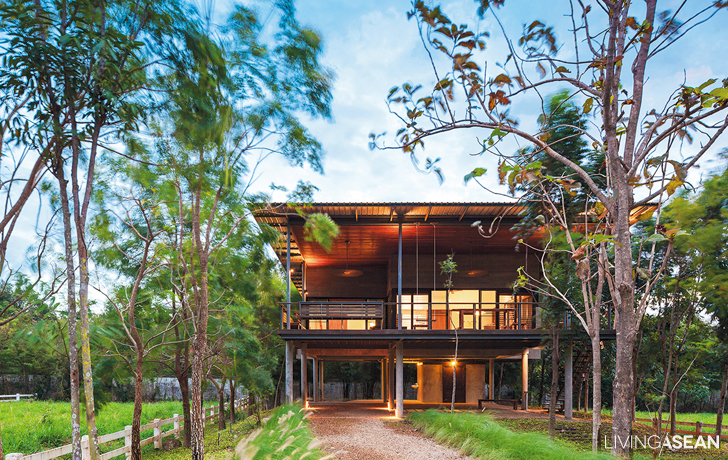 The house-on-stilts design allows nature to permeate and ensures good air circulation. 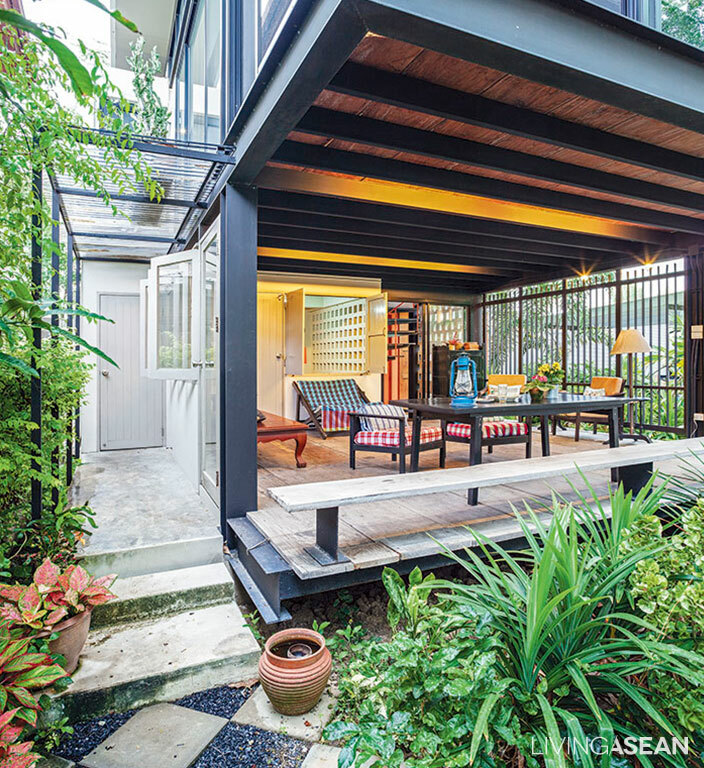 Plenty of under-floor spaces allow small vegetation to thrive. At a glance, they conjure up images of little houses in the big woods. 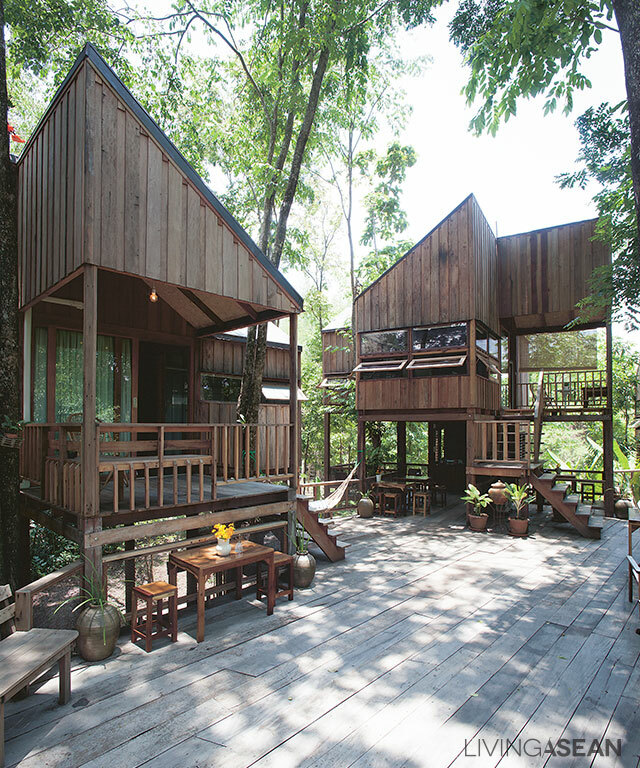 Four beautiful and tranquil homes are nestled in a surrounding forestland of northwestern Uthai Thani. The resort hotel is the brainchild of Chantita and Paisan Kusonwatthan. The owners started re-growing and restoring the area some thirty years ago. Later when development began in earnest in 1996, the area was meant to be their retirement home. 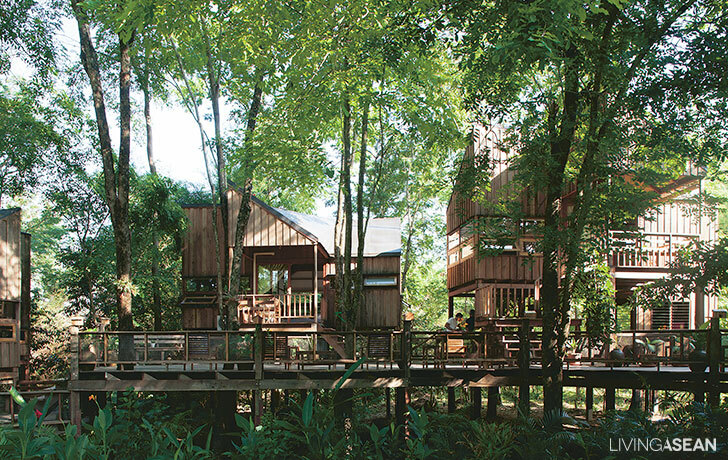 Through hard work and dedication, the property grew to become a lush woodland full of vitality. It gave rise to the idea of opening it to the public. 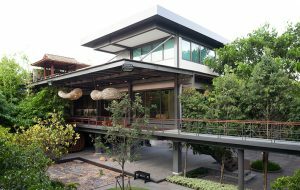 Now the post-retirement project becomes a hotel, appropriately named “Bansuan Chantita.” Bansuan is Thai for garden home. 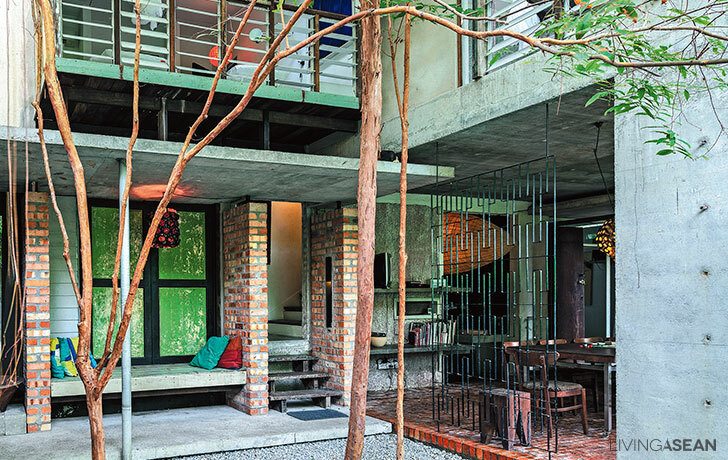 Prakij Kanha of Studio Miti explains: “First and foremost, we set out to save every tree on the property. 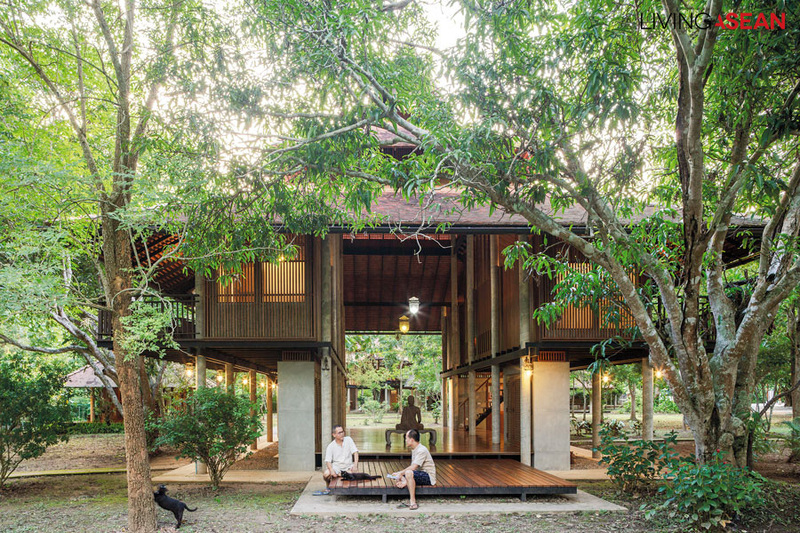 It is our duty and responsibility to find common ground between nature and architecture.” The architect took great pains to measure every space among the trees. The average area was then used as the basis for designing homes on the property. Only after that did he begin work on the design concept. It took the form of a “plus” symbol. 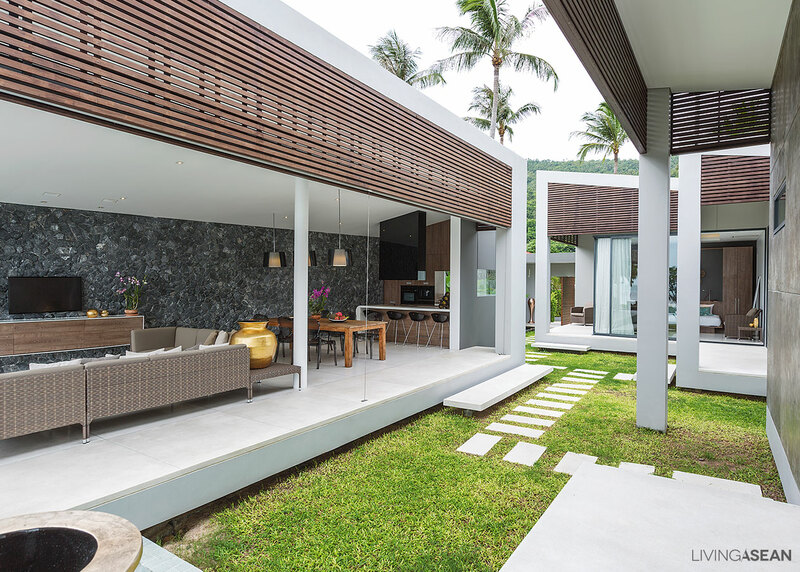 The tropical living house design and remain Thai lifestyle by design terrace in front of the house. All living spaces are designed to be proportionate with one another in size, amount, and frequency of use. 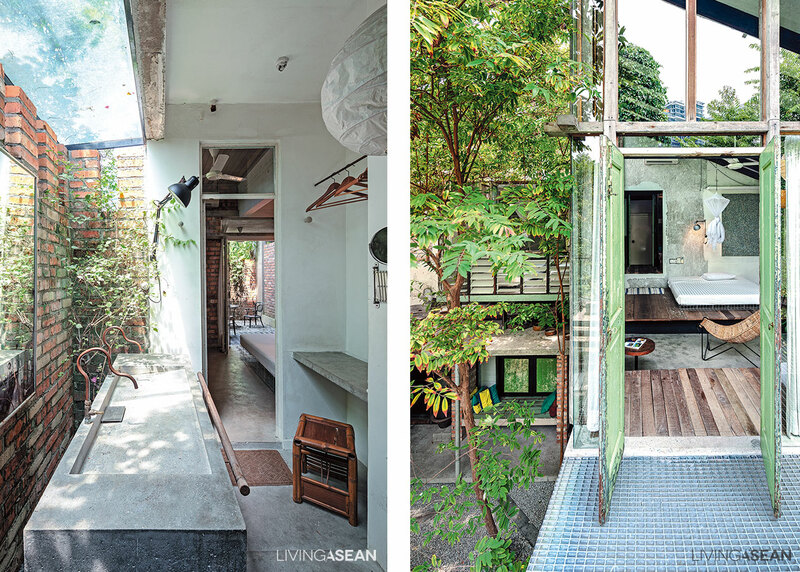 Different spaces are designed with different needs in mind. 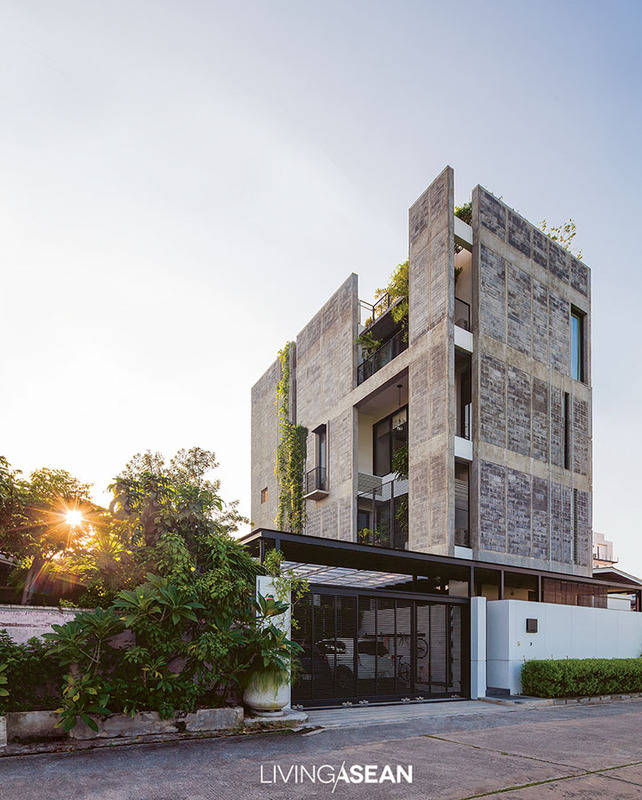 The design scheme calls for the four units to be conveniently linked by a system of wood passageways winding through the lush botanical garden setting. 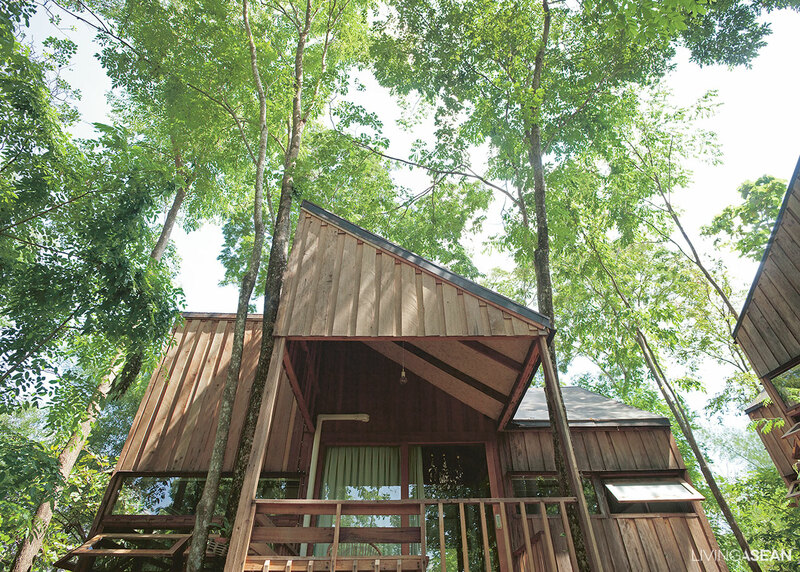 From the outside in, the resort hotel looks and feels like it is an inextricable part of the forest in the backdrop. 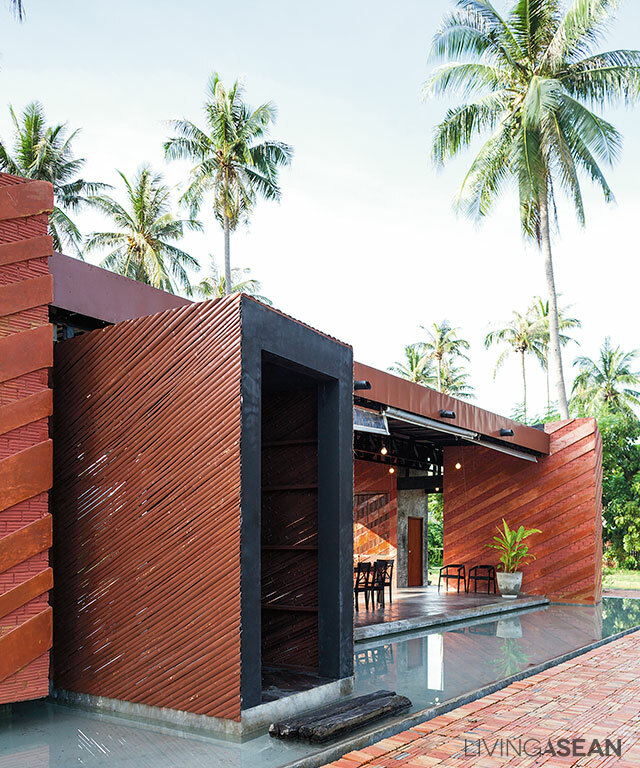 By emulating the Thai-style design, the architect ensures that no space goes to waste. Small vegetation thrives on the forest floor below. Crisp, cool breezes are ever present, and nature permeates everywhere. 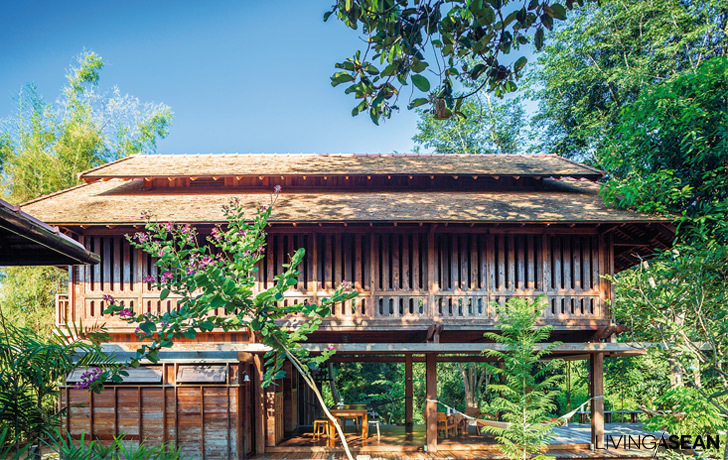 Inspired by the Thai-style house design, the wood deck provides a lot of nature at the doorsteps and easy access to all parts of the hotel. 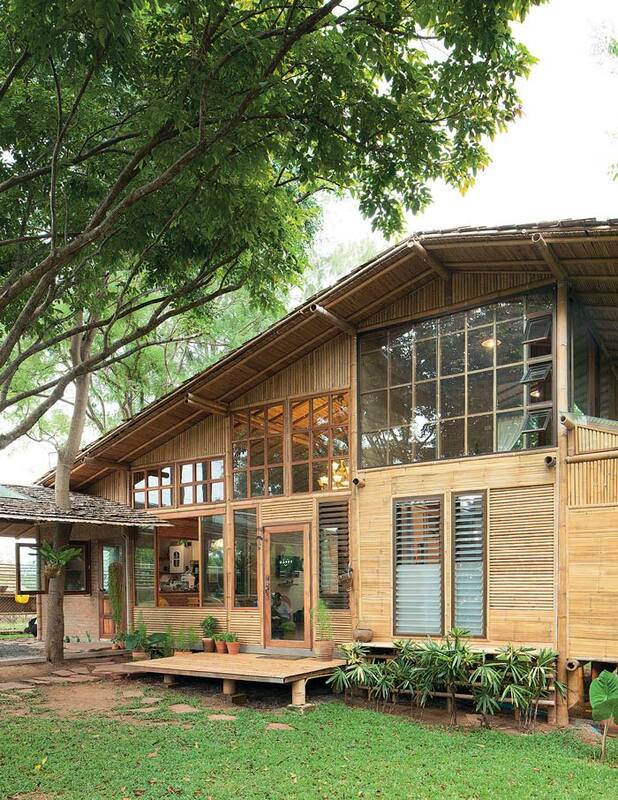 The house exterior walls and outdoor decks are made of recycled wood. The preference was based on two reasons. First, it was a smart move because the price was right. 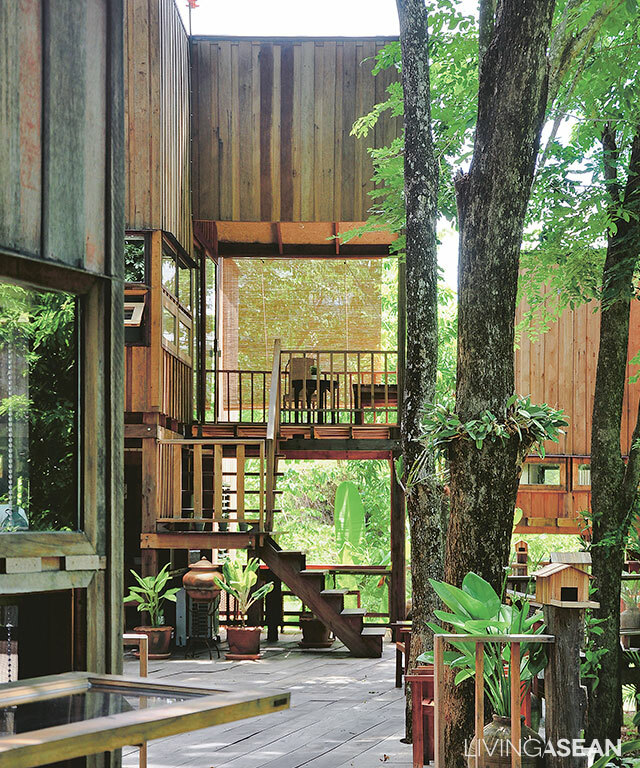 Second, it creates a warm and enchanting atmosphere in the midst of nature. Recycled wood still shows sign of use, while painted surfaces in a variety of colors serve as camouflage clothing that blends in with the surroundings. 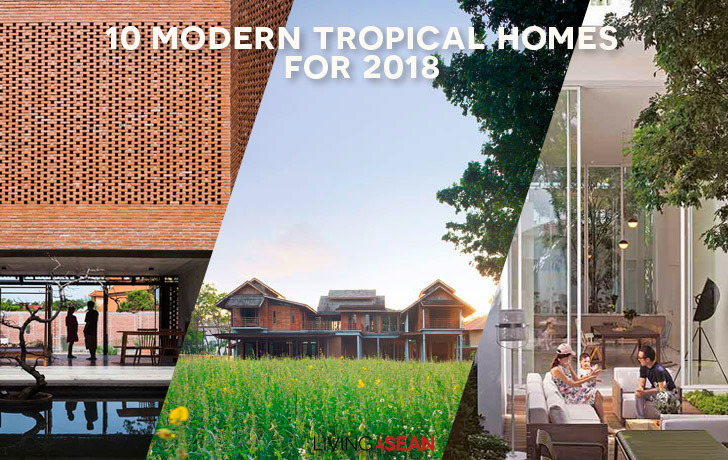 What makes these tropical houses stand out is the understanding of nature and the knowledge to incorporate it into the design scheme. 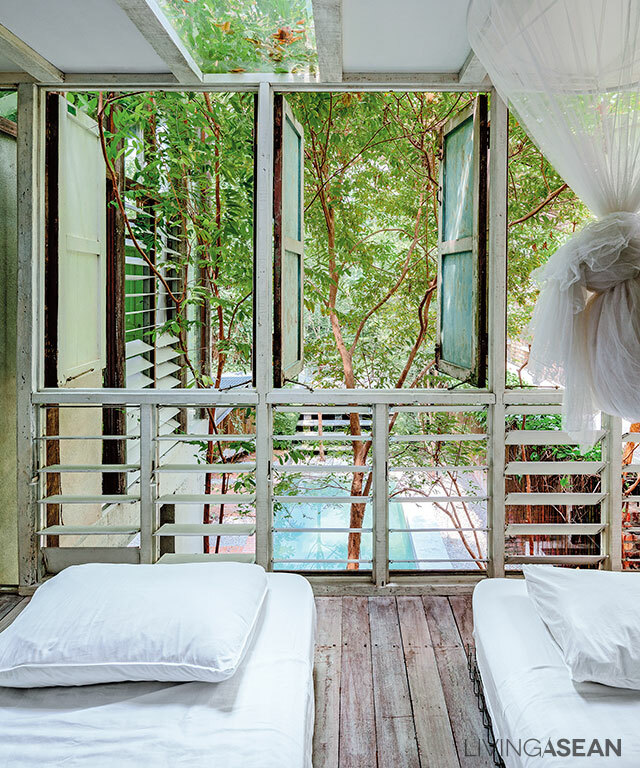 The garden paradise is an escape into nature. When nature becomes a part of our home, our souls are nurtured. 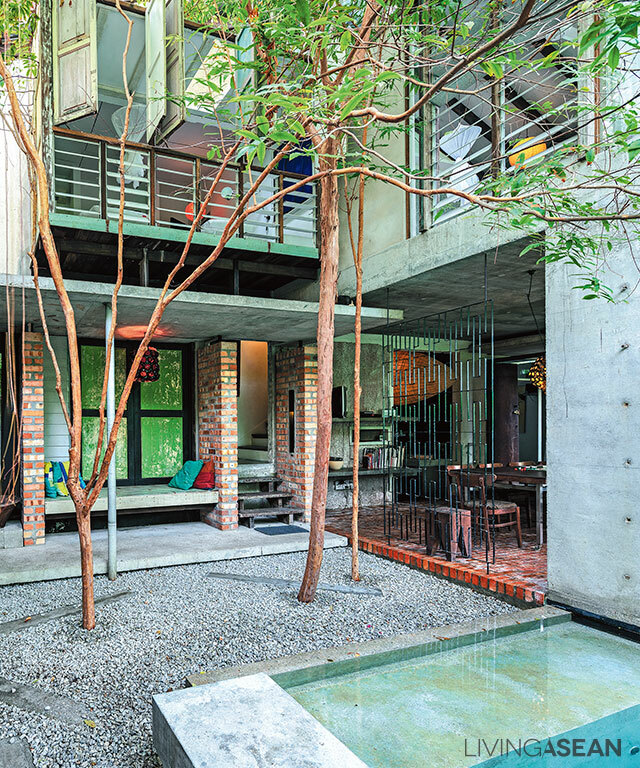 This concrete house in Malaysia took its first step of creating a sanctuary of mind. 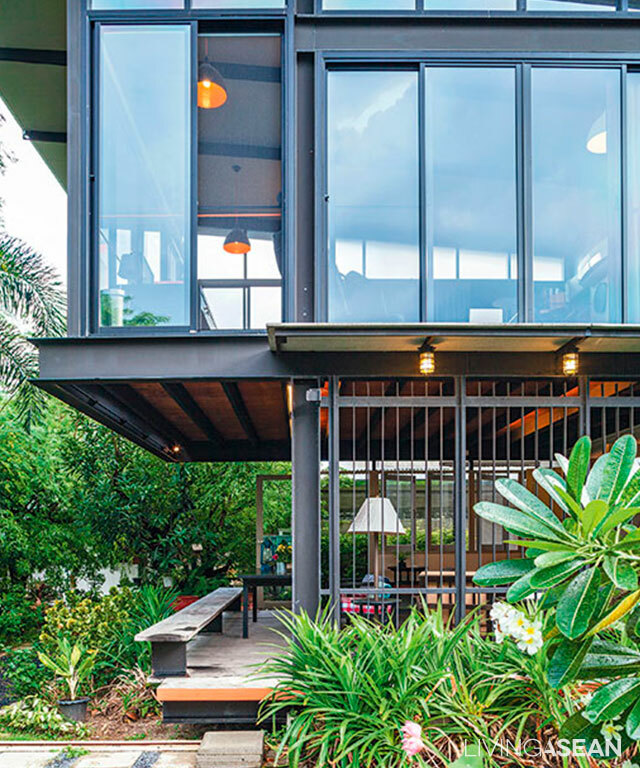 Steel structures are used in remaking this new house. Steel technologies provide a fast and convenient alternative. “Sekeping Tenggiri” searching on the Internet, you can see the amazing place. It is where Malaysians love to shoot their pre-wedding photographs. A part of it is remade into a guesthouse for those to stay. 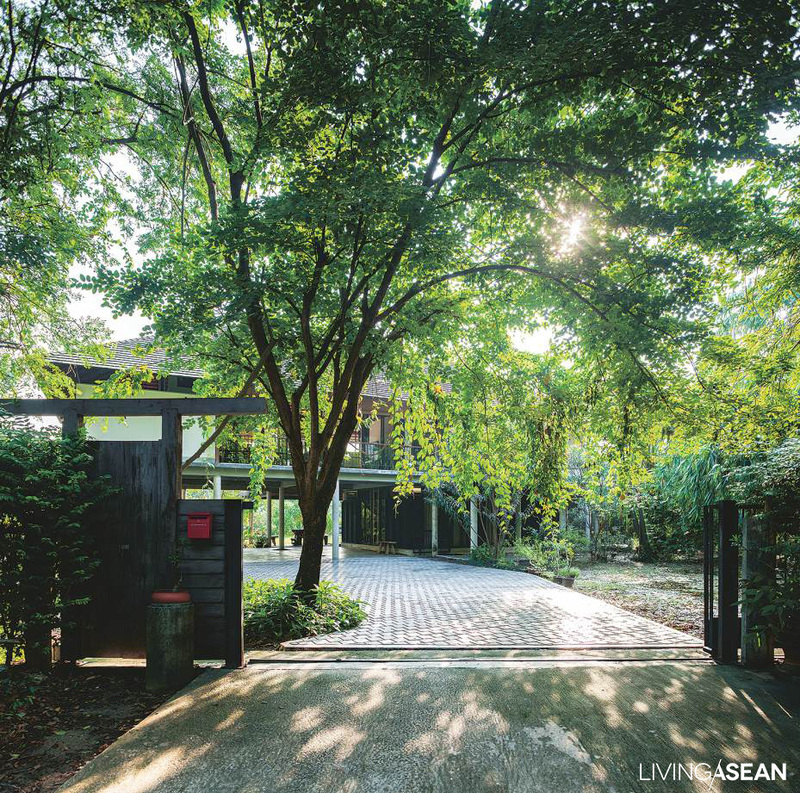 The house belongs to Ng Sek San, founder of the landscaping and architecture firm Seksan Design. 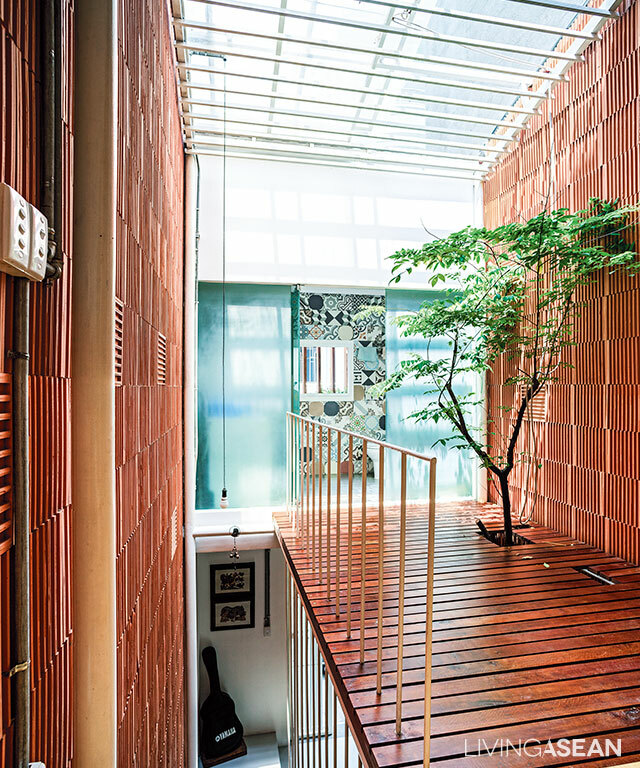 Plants and natural light combine to soften the harsh surfaces of building materials, making it a warm and well-lighted place. 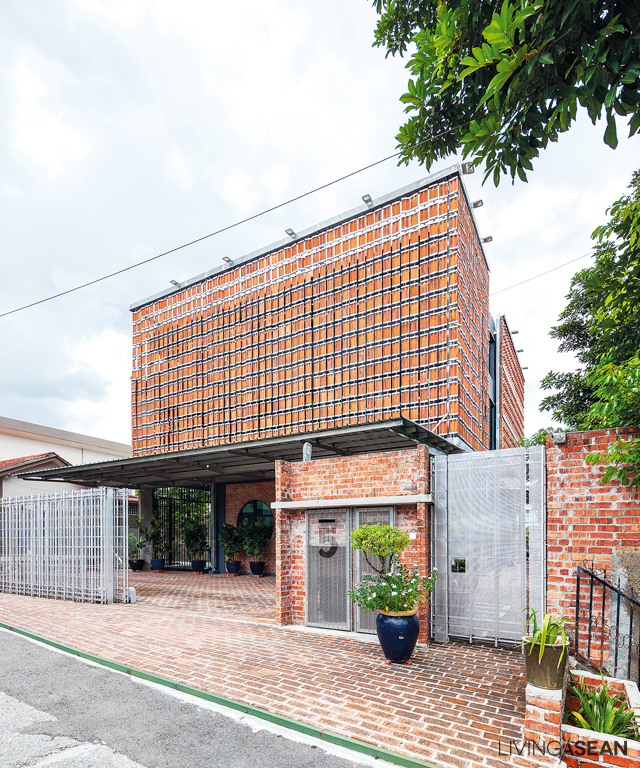 Located in Jalan Tenggiri district of Malaysia’s capital Kuala Lumpur, the part of the small plot of land. 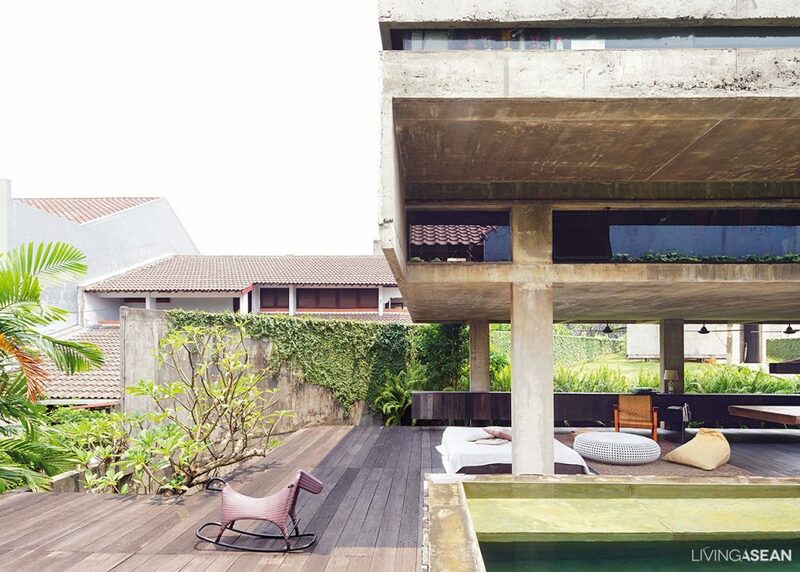 Nonetheless, the owner effectively incorporates plenty of natural features in this architecture. The owner tells us that remake from what used to be two adjacent houses. He obviously made a clean sweep. Ng is also an art collector. That explains why one side of it is devoted to enviable art collections, which are public open. No admission charge. 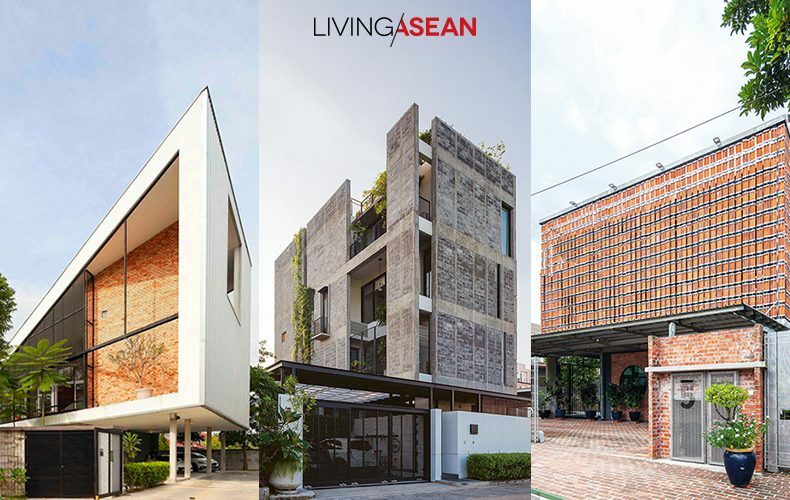 The same building materials are used on both the exteriors and interiors to create visual continuity intended by the architects. 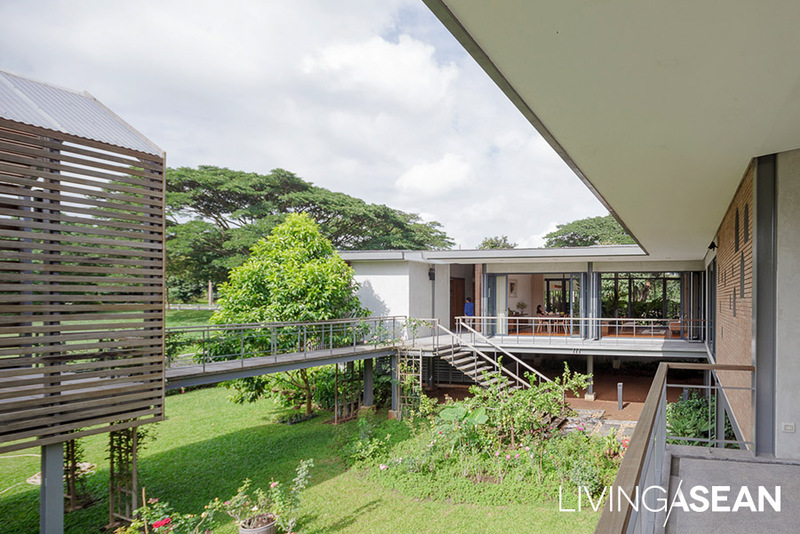 The two-story home has a full array of functional areas, from the sitting room, dining room and kitchen to a swimming pool and seven bedrooms. The owner is a landscape architect. Working on this house, he starts small from a humble garden and gradually makes inroads into bigger projects on the interiors. 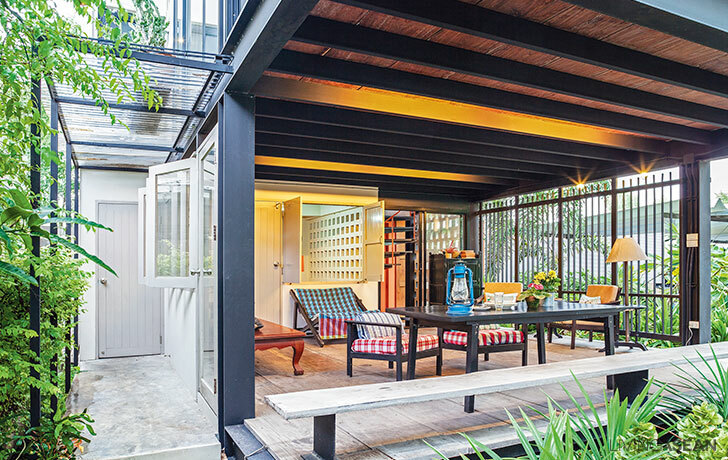 To him a garden is a room and his exterior design spaces more look like an extension of the interiors too. 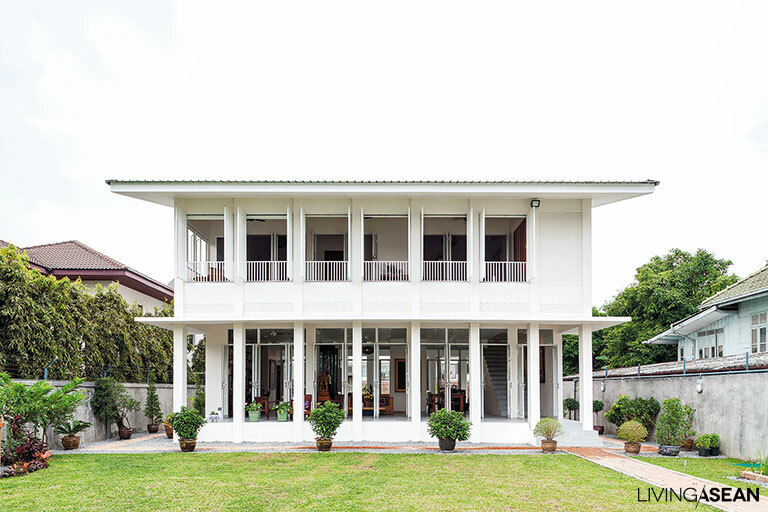 The ground floor features a dining room that connects immaculately with the swimming pool and the garden at the far end. 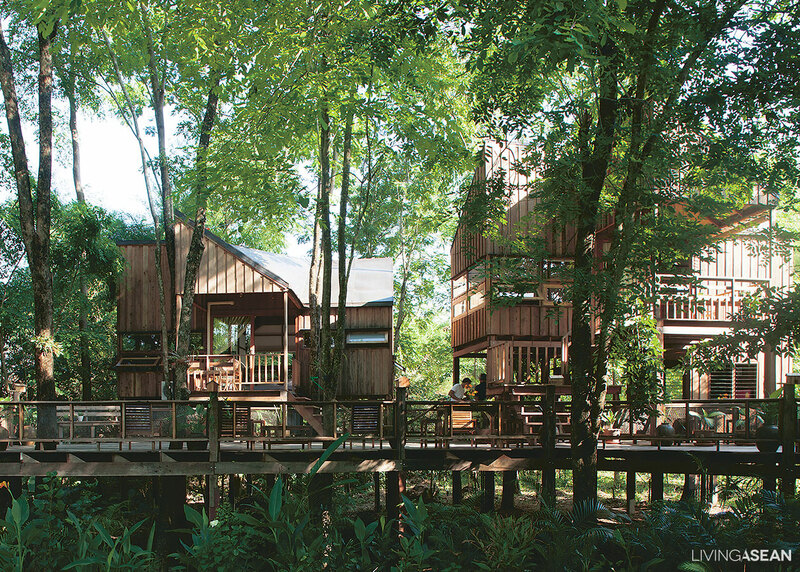 Thanks to the canopy of tall trees, cool breezes can be felt all day. Floorboards and concrete roofs. In general, are built 10 centimeters thick, but it is only 7 centimeters here. There are gaps, about 5-10 centimeters, between the ceiling and the top edge of the wall for good ventilation. 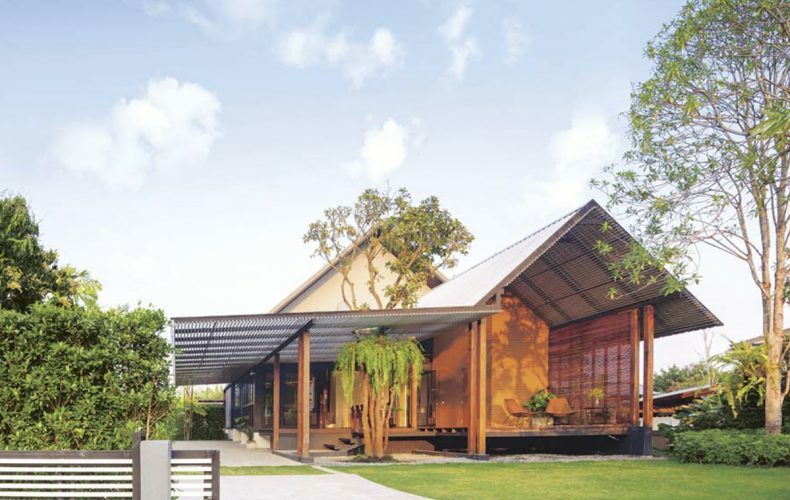 A good example of Modern Tropical style, the house is designed to reduce heat and prevent problems due to moisture. As long overhangs and awnings, which protect against scorching sunlight. 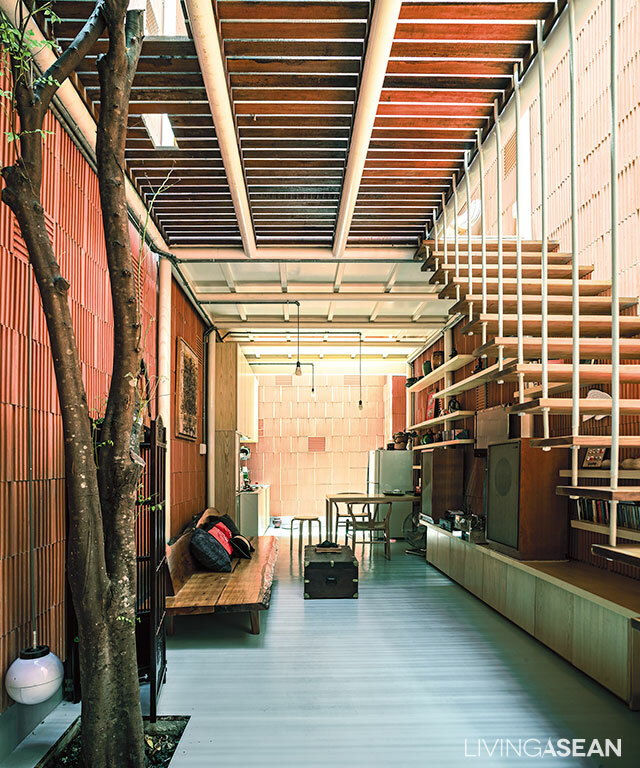 Exposed roof sections and plain floors make a simple seeing. The materials used are quite commonplace, such as concrete masonry, bricks, wood, and steel. 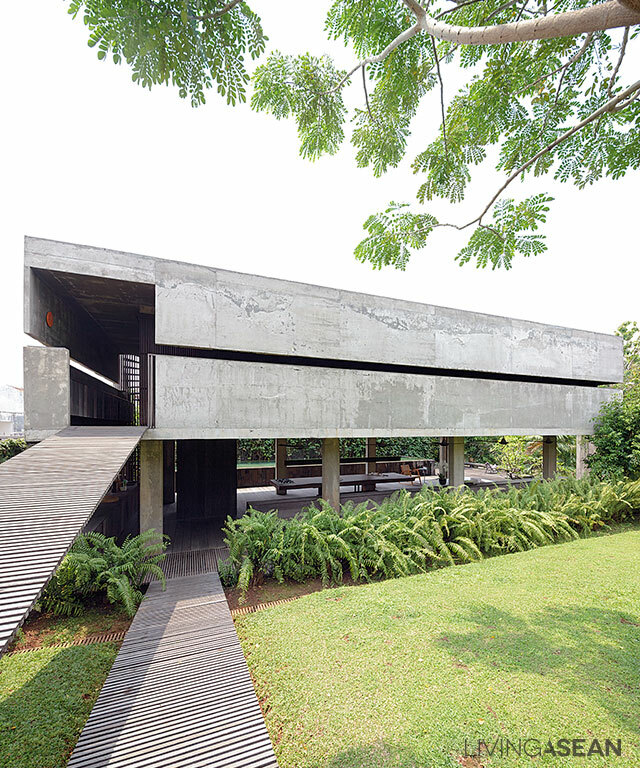 The main structure is steel-reinforced concrete. Other details allow the nature to participate. To a comfy living space. Upstairs bedrooms are mode cool by air circulation resulting from raising the floorboard 40 centimeters from concrete floors. 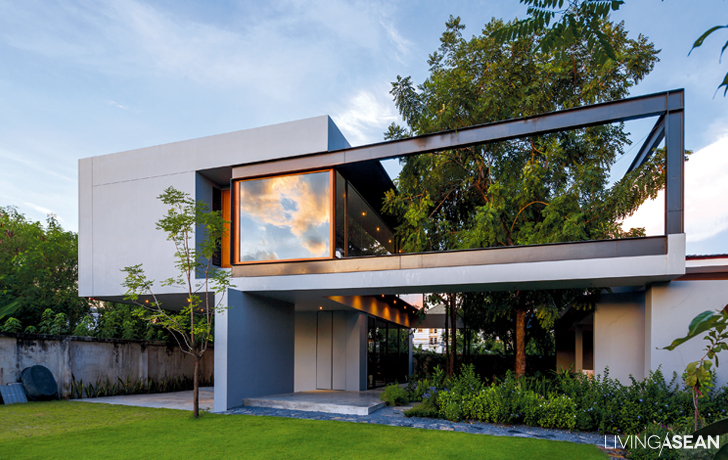 Opaque walls are out, while glass Louvre windows are in, resulting in light and airy interiors. 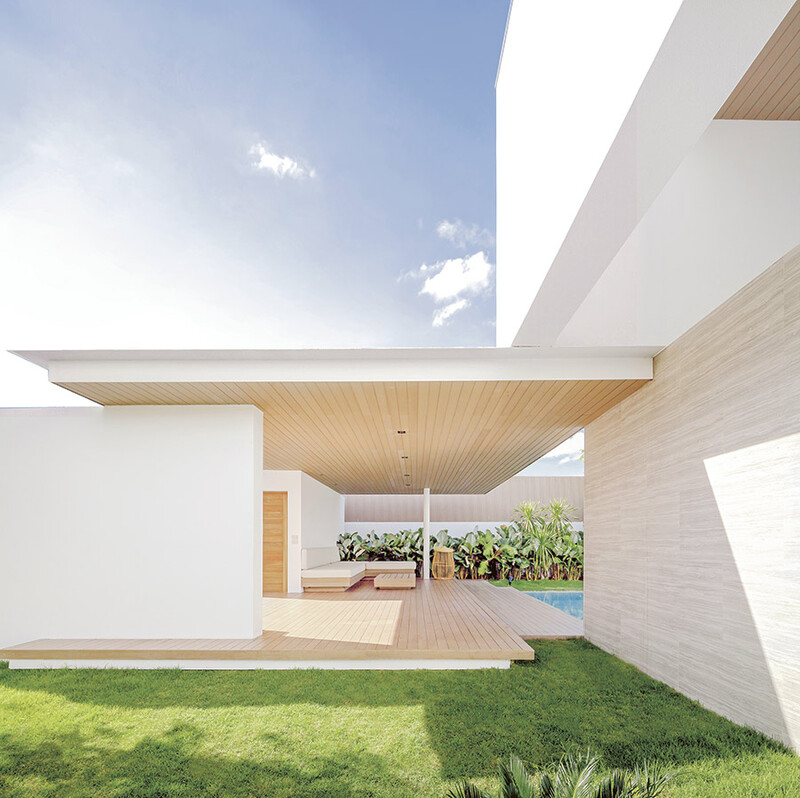 Parts of the roof are made of transparent materials to allow for more sunlight, especially over the swimming pool. The master bedroom on the second floor is simple and raw. 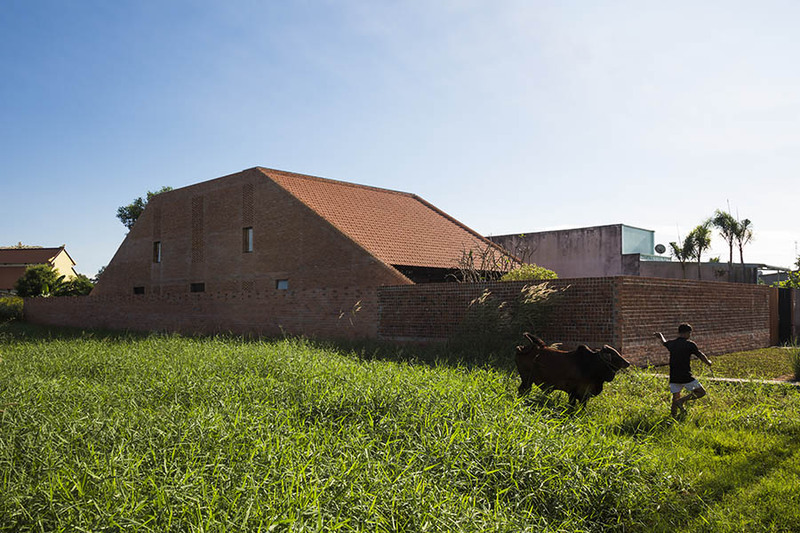 Exposed brick walls, crude concrete floors, and windows that open wide from one corner to the other combine to enhance visual continuity with the natural surroundings. Who says underneath the window has got to be an opaque wall? Not true. Here, Louvre windows are used to promote air circulation. A renovated bathroom features a raised floorboard to accommodate new plumbing. The dry section is open to wide variety of materials, but for the wet section easy-care products, such as tiles, are a smart choice. 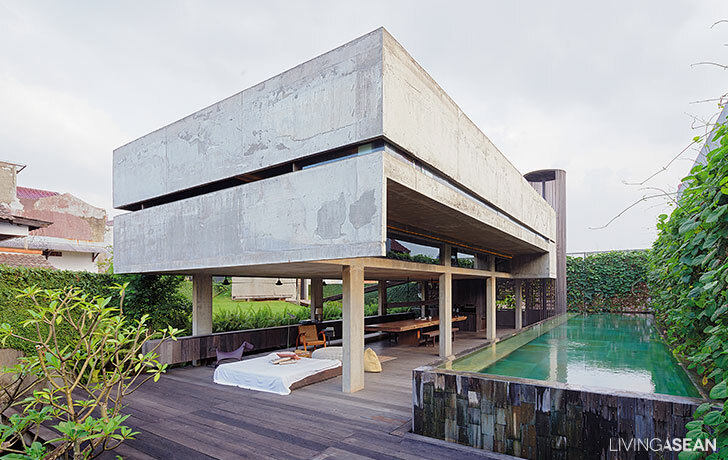 This concrete house has plenty of passageways that promote air circulation. 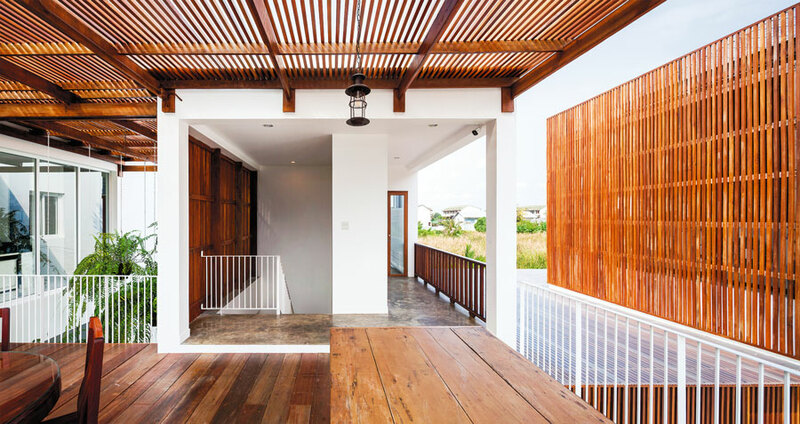 For example the air passages between wooden floorboards, along the corridors and exterior walls. 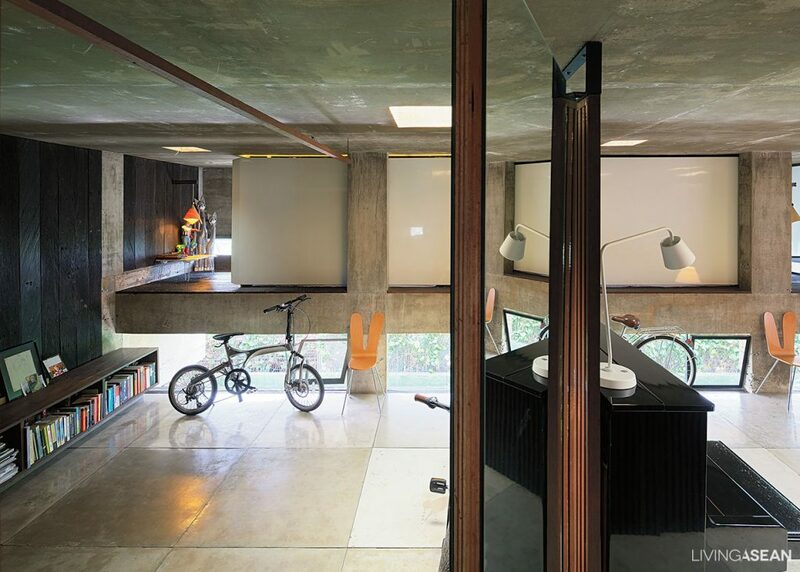 They also make the house appear uncluttered and incredibly relaxed. 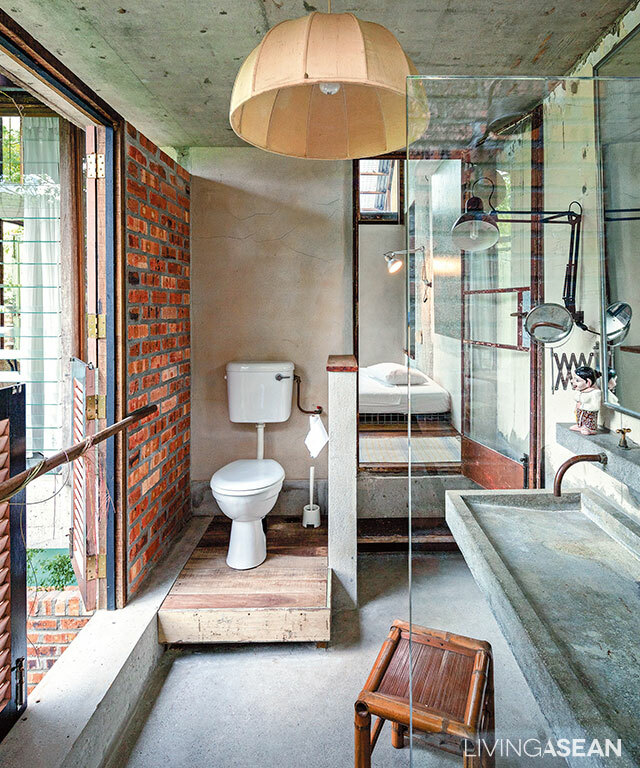 Skylights installed above the bathroom help indoor plants flourish. 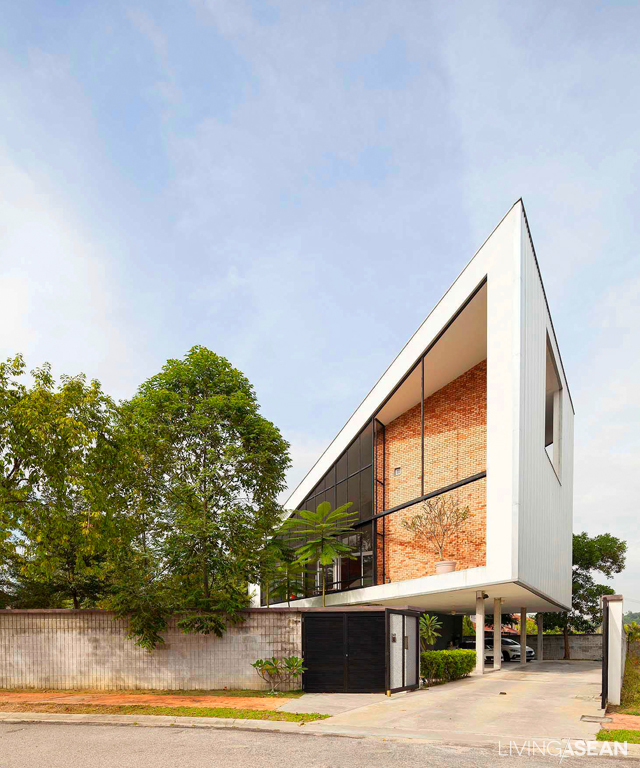 /// The house and surrounding vegetation combine into one. 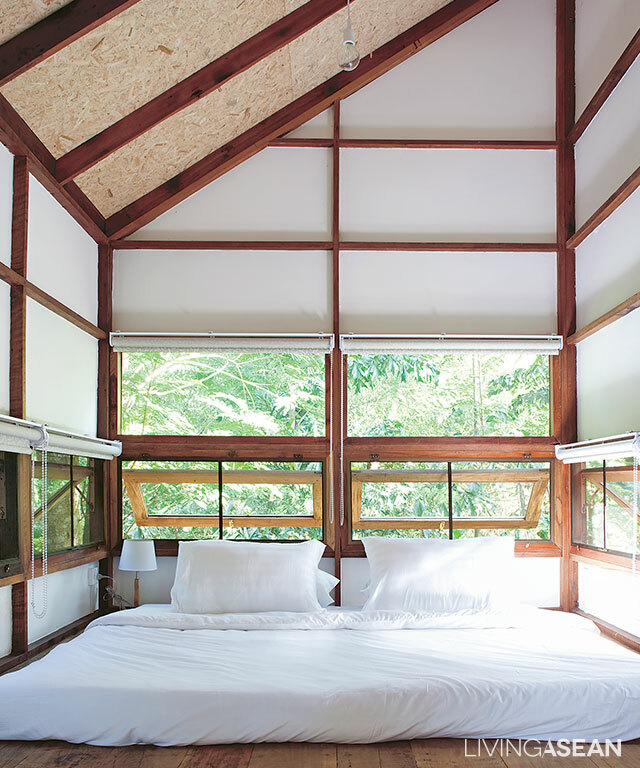 Natural building materials no doubt make for comfy living conditions. 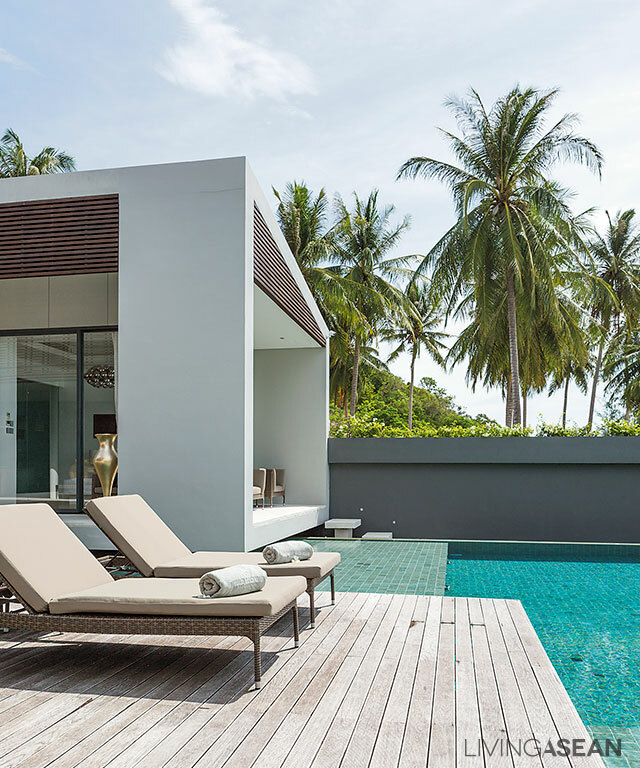 A beachfront home is built based on a simple exterior design, yet it is a perfect hideaway to relax in a tranquil environment. 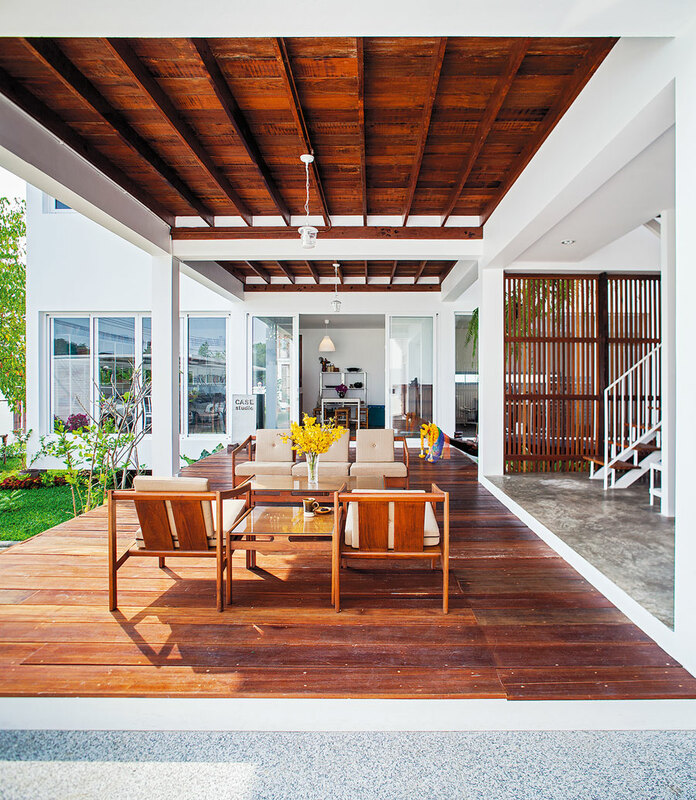 The seaside landscape features a wood pergola with white drapes and a canopy. Lush sun-loving shrubs provide a pop of color to the beachfront. 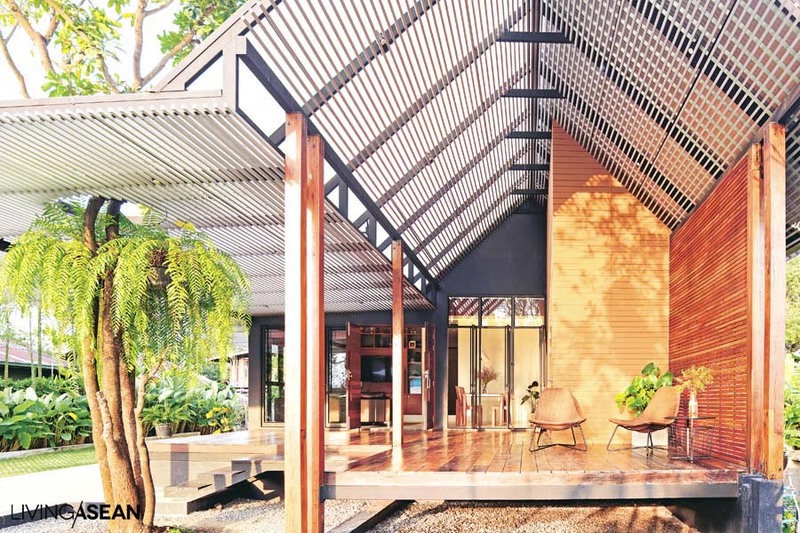 Here is a simple home designed for easy coastal living. 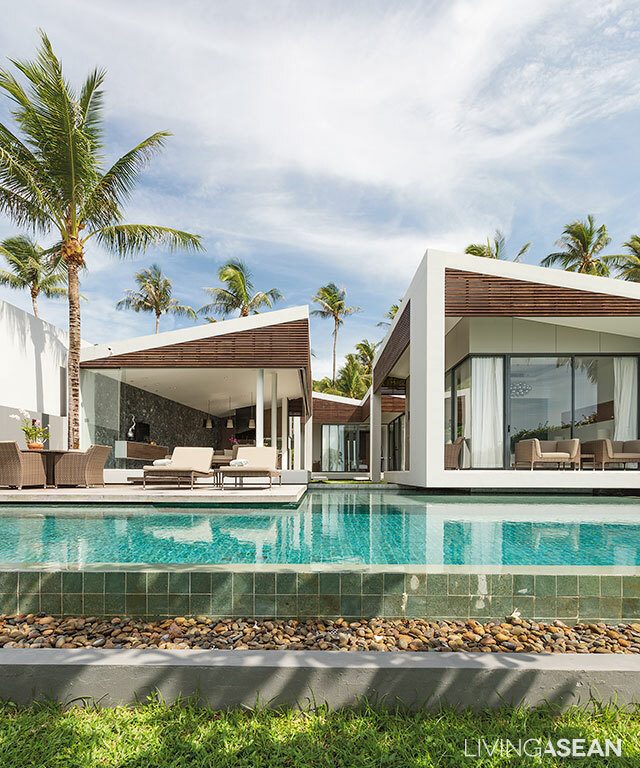 It is nestled on the peaceful western shore of Samui Island. 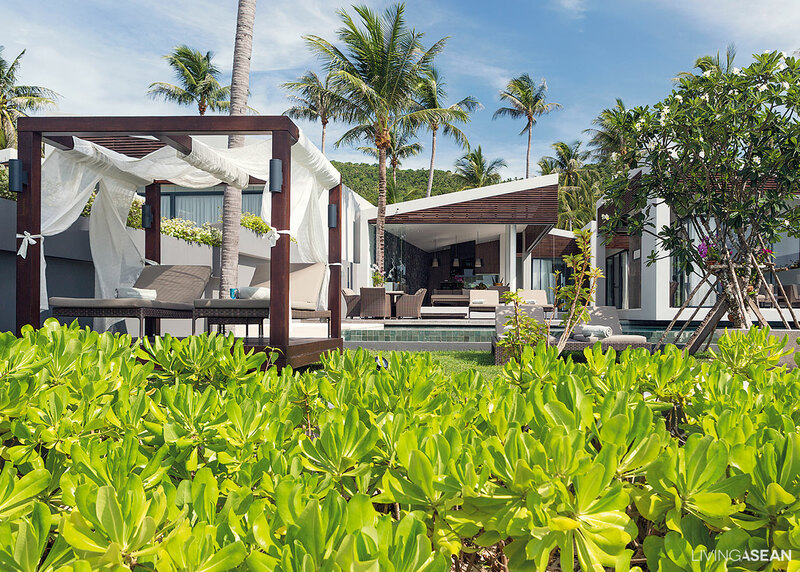 The neighborhood is known for envy-inducing outdoor spaces and stunning sea views. 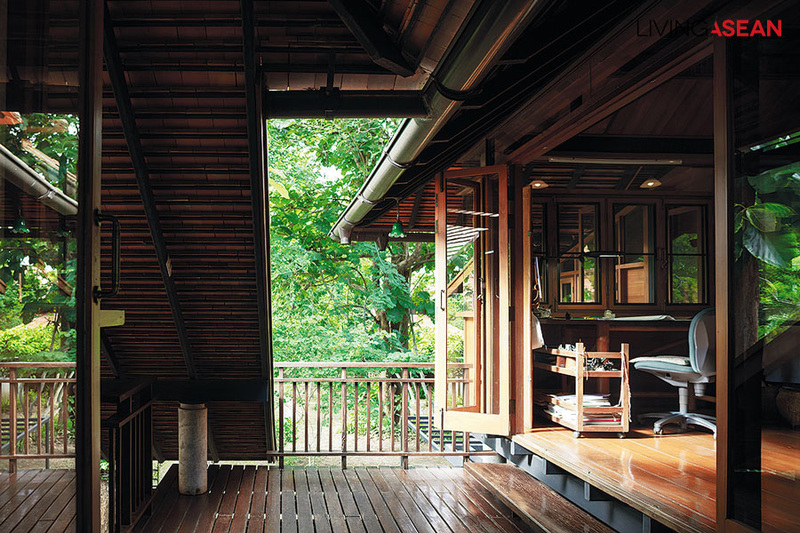 The space between buildings allows for ventilation and abundant natural light, keeping the entire home clean and cool. 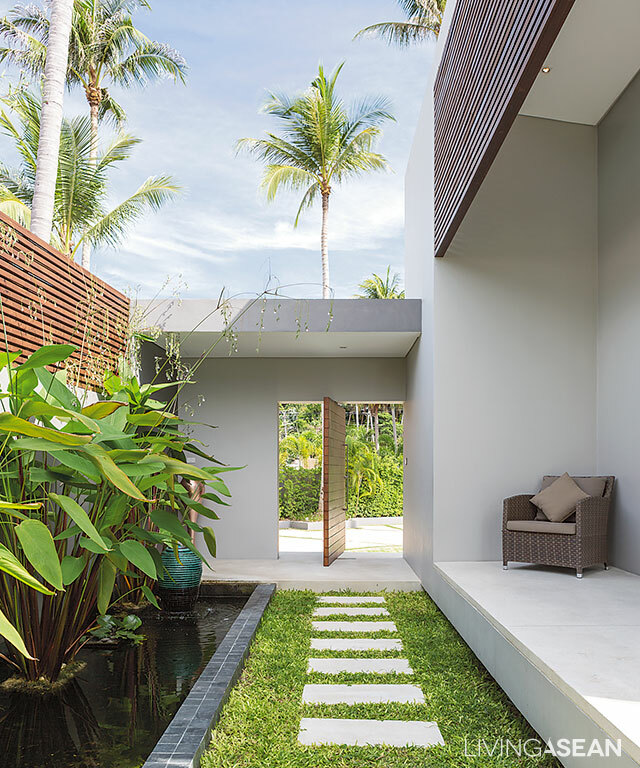 Outdoor tiles in complementing tones line the walkway between buildings. Grass growing in between pea gravel tiles help reduce the effects of sun glare on eyes. 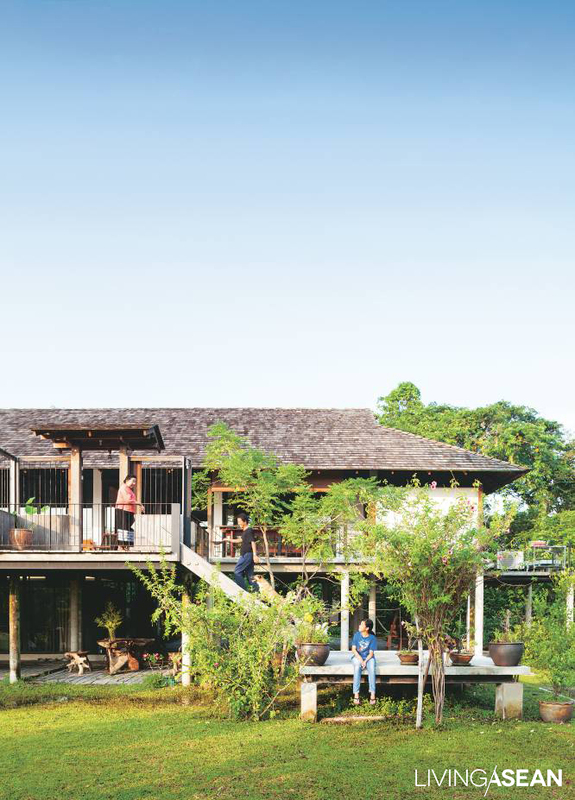 The waterfront home sits on a rectangular plot of land large enough for building a good-sized house. But the property owner is not looking for a design that is twice longer than wide. 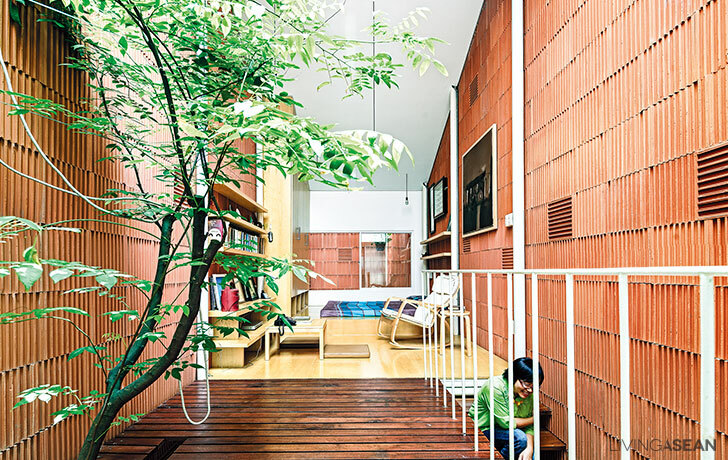 Because a rectangular floor plan may be lacking in variety, he opts for something else more interesting. 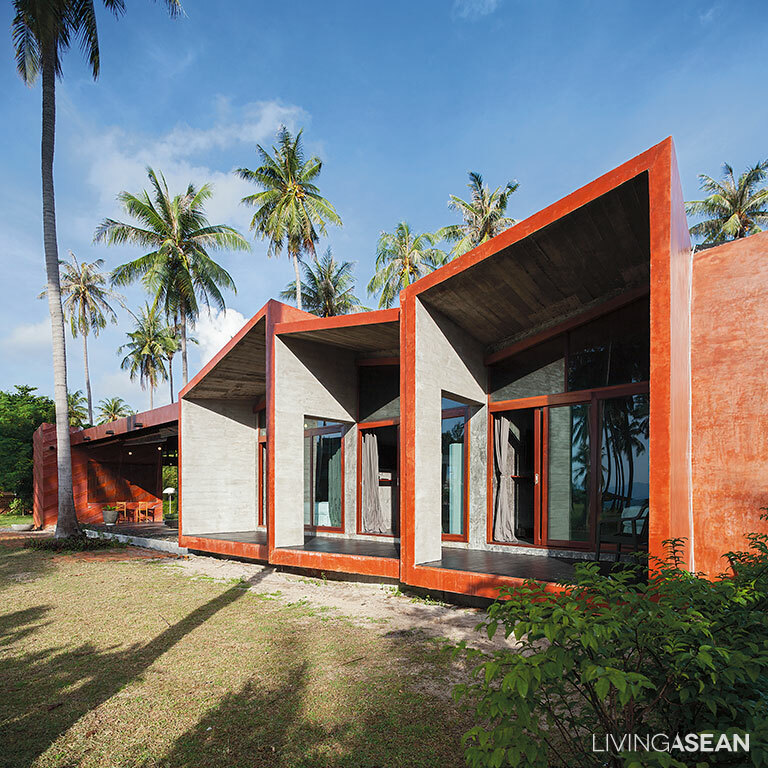 The result is a neatly planned vacation home comprising three detached units. 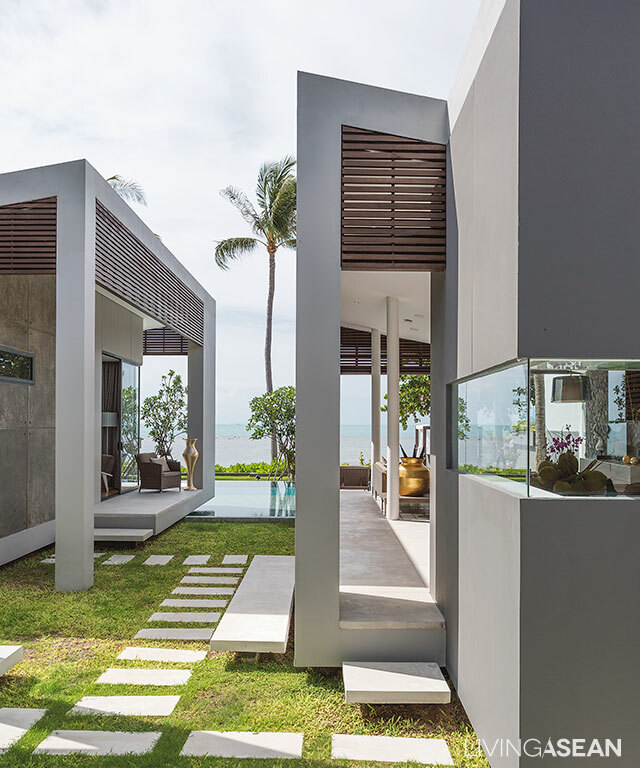 All of their front rooms are positioned to take advantage of the waterfront’s views and breezes. The sundeck extends from the multiple function building to connect with the infinity pool. 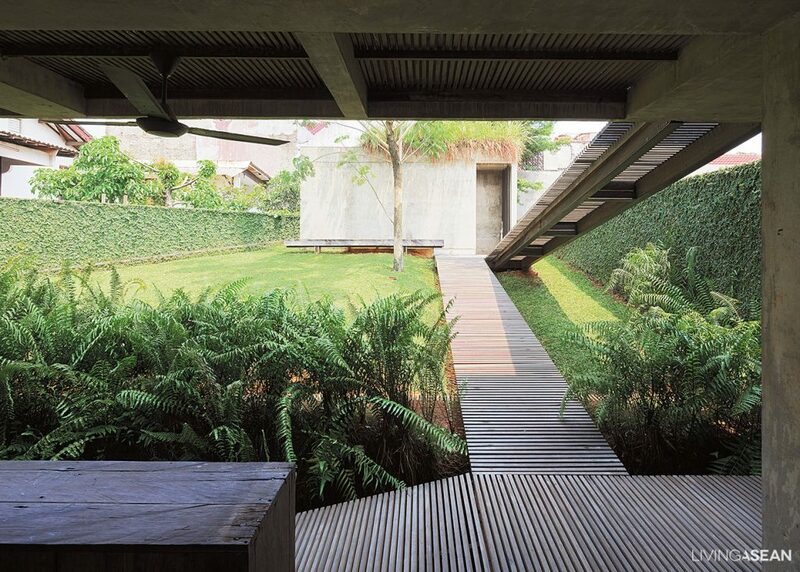 Because the property ascends slightly from the beach, a retaining wall is built to mark the perimeter. 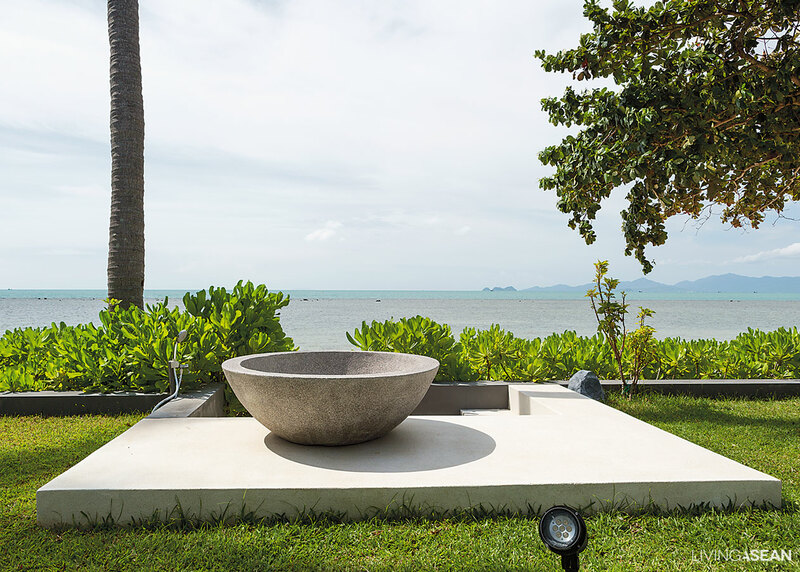 The sun deck featuring a concrete vessel is crafted of pea gravel concrete. Behind it, a set of stairs leads to the beach below. The three shed-roof buildings sit facing one another and come in different sizes. Their floors are raised 50 cm above the ground. The largest unit features a semi-open design to serve multiple purposes, incorporating a seating area, dining room and pantry. Next to it stands the second building with master bedroom with ocean views. An infinity pool, lush greenery and the beach lie between the two buildings and the open sea. The third building, which is set further back, features two en suite bedrooms. It is the first to be accessible from the street. 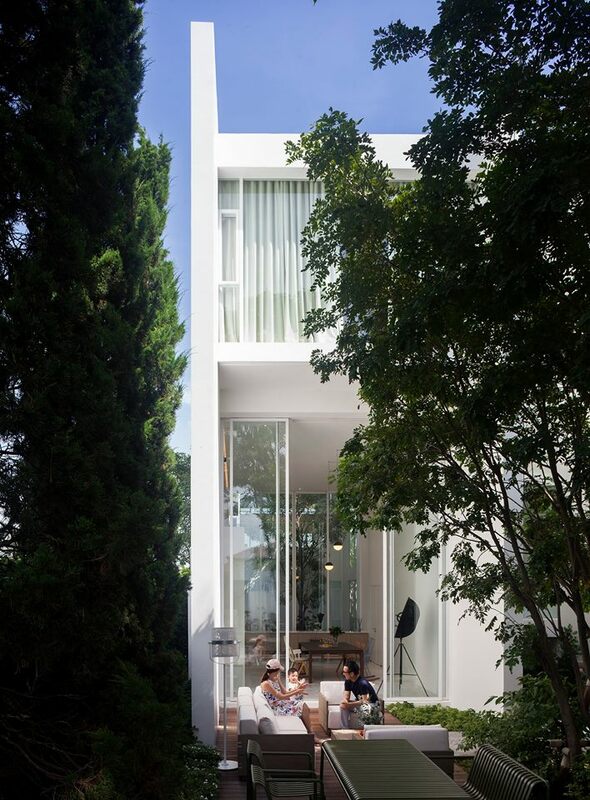 The three-unit home boasts clean line exterior design with an emphasis on relaxing hues, such as white, gray and beige. 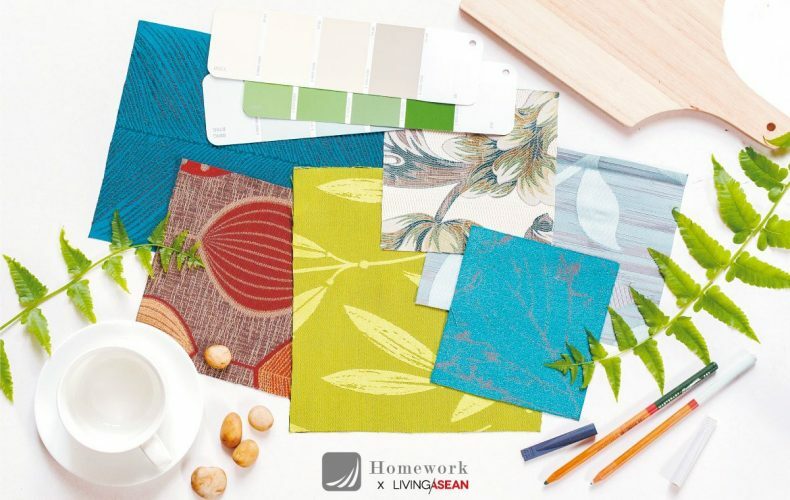 Wood accents come in natural color and finish design to never go out of style. The multiple-purpose unit, which is the largest of the three, features generous seating spaces and a pantry. 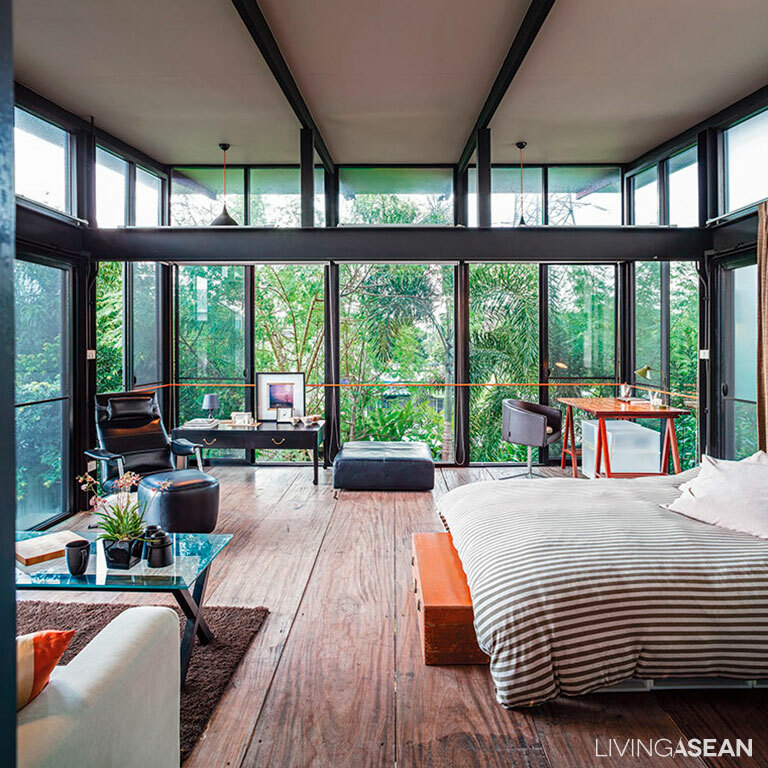 Open design ensures the rooms get abundant natural light and fresh air. For a vacation home, the pantry comes in handy for quick meal preparations. 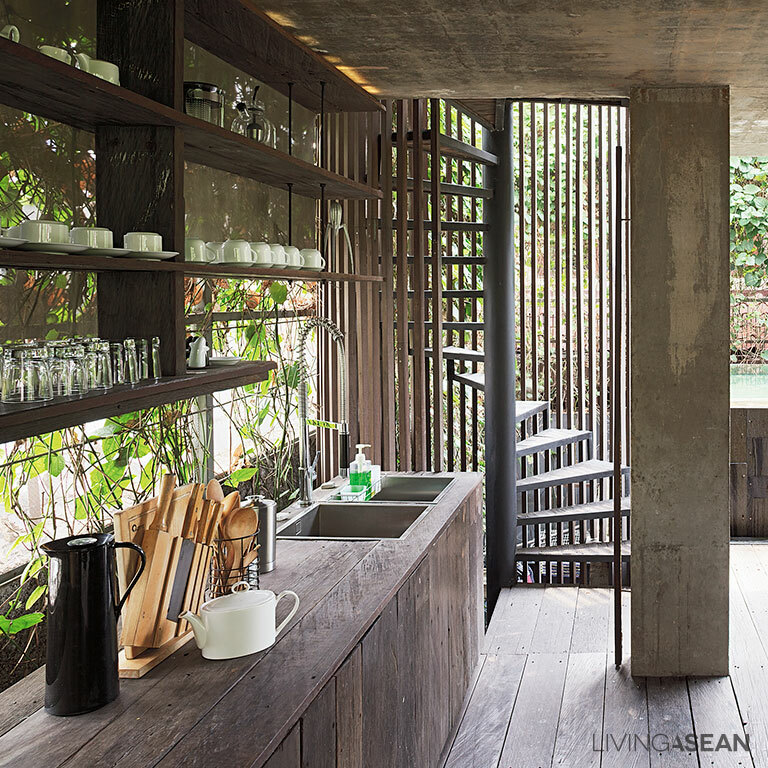 The dining area next to the pantry boasts a set of teakwood table and clear chairs. 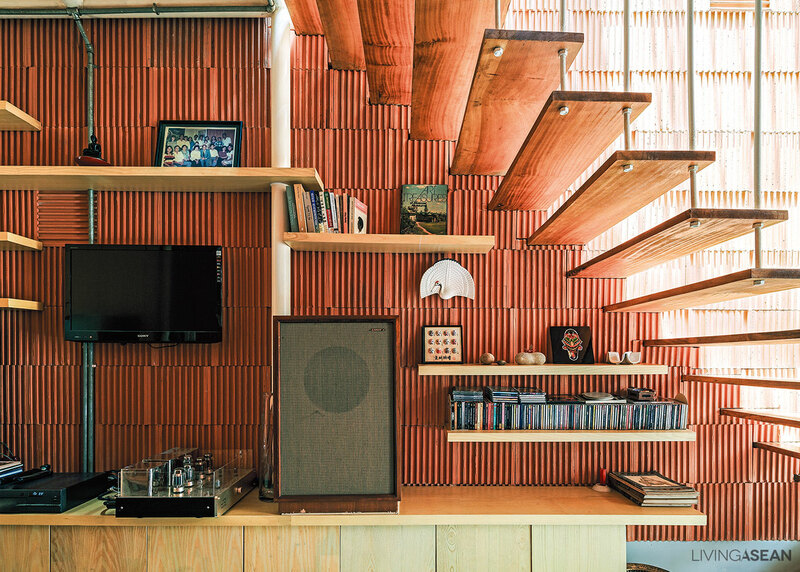 Rock wall adds texture and an intimate feel to space. 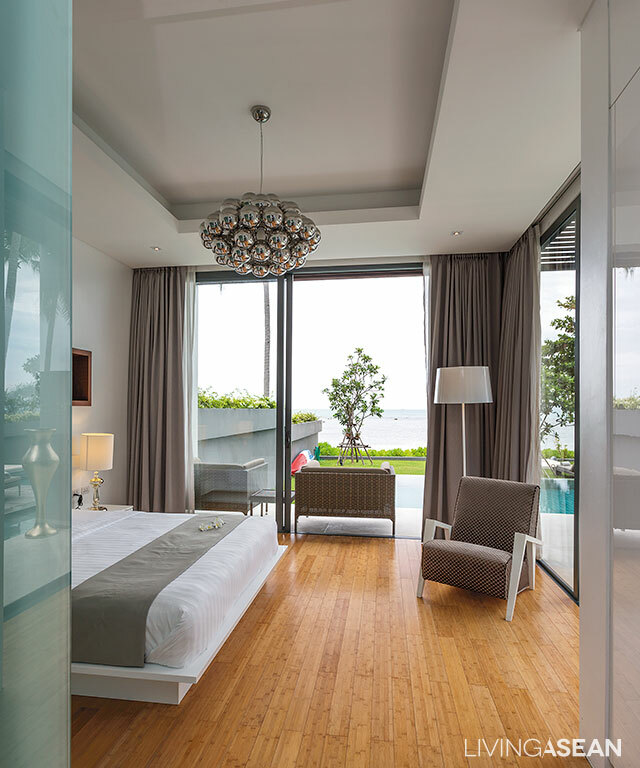 The master bedroom boasts sweeping sea views, thanks to large glass paneling on two sides. Wood flooring adds a pop of color and warmth to the intimate space. 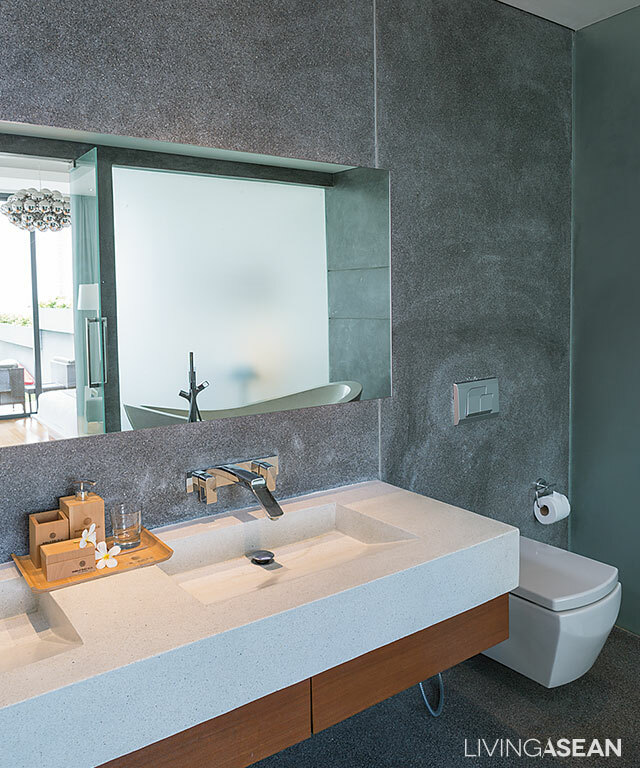 The dual-sink countertop in the master bathroom features polished stone finishes in soft white. Translucent laminated glass siding separates the bathroom from the master bedroom. 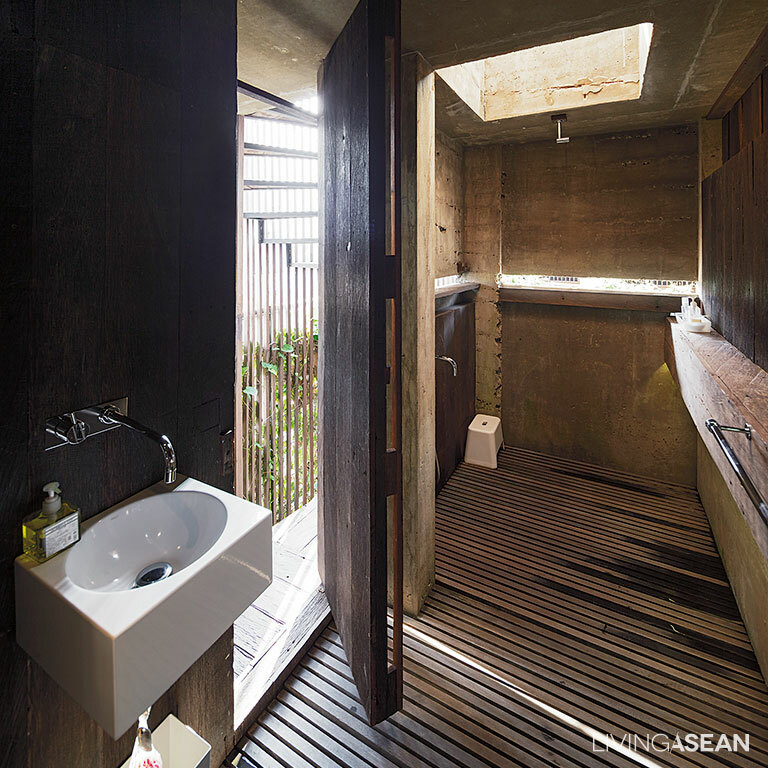 Plenty of natural light ensures the bathroom is well lit despite its dark color effects. Open design allows an abundance of natural light and breezes to flow easily through the three buildings. 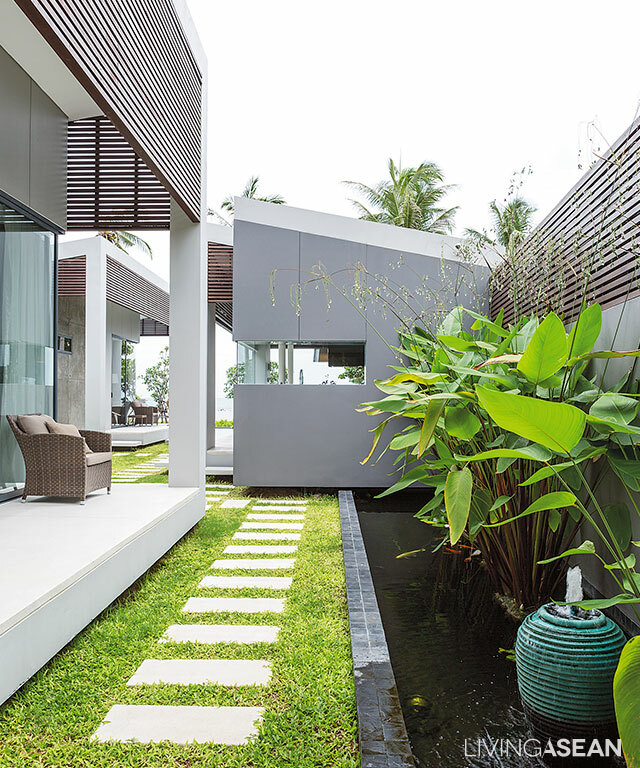 Genius landscaping ideas help keep the interior spaces cool naturally, while lush foliage provides for comfortable outdoor rooms just steps away from the sparkling blue waters. 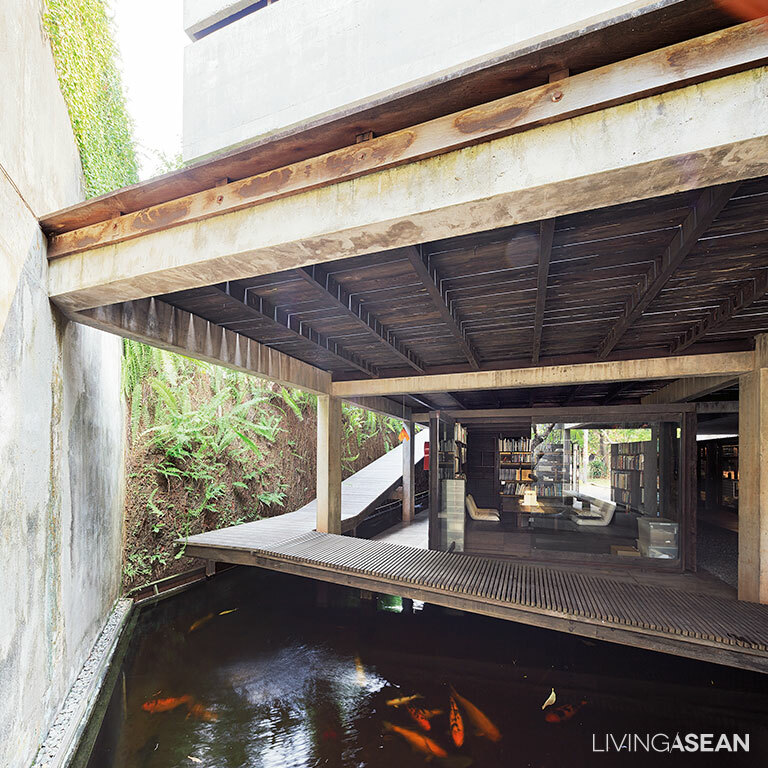 The passageway separates the fishpond from the two-bedroom unit in the rear of the property. The house is accessible from the parking area via a revolving door. 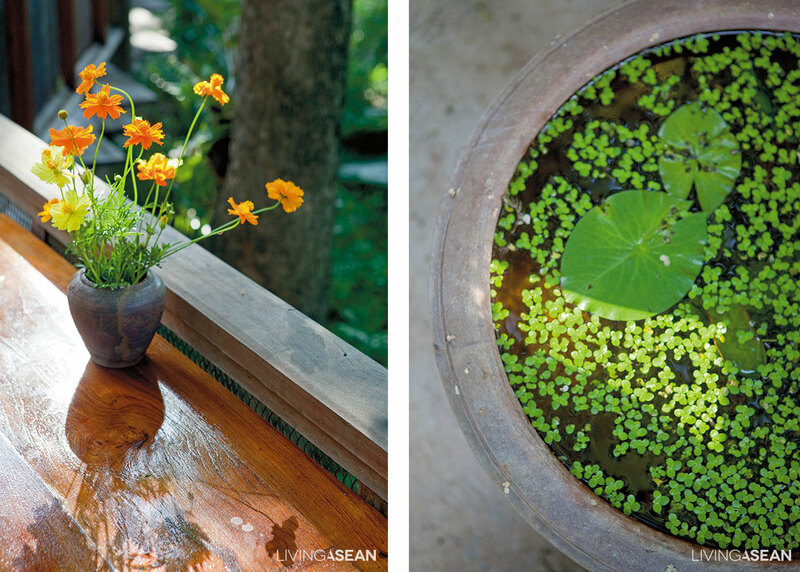 Sounds of water circulating in the fishpond communicate a warm welcome.